Almerico Law – Kendall A. Almerico, P.A. None of the Securities Offered Are Being Sold By Present Security Holders. Unless Extended or Terminated Earlier By The Issuer. THIS COMPANY SHOULD ONLY BE MADE IF YOU ARE CAPABLE OF EVALUATING THE RISKS AND MERITS OF THIS INVESTMENT AND IF YOU HAVE SUFFICIENT RESOURCES TO BEAR THE ENTIRE LOSS OF YOUR INVESTMENT, SHOULD THAT OCCUR. (3) There are no finder’s fees or other fees being paid to third parties from the proceeds, other than those disclosed above. See "Plan of Distribution." REGULATION A. FOR GENERAL INFORMATION ON INVESTING, WE ENCOURAGE YOU TO REFER TO WWW.INVESTOR.GOV. This offering consists of Shares (the “Shares” or individually, each a “Share”) that are being offered on a “minimum-maximum best efforts” basis, which means that until the minimum of $13,900,000.00 of Shares are sold, all subscription payments will be placed in an account held by the escrow agent, North Capital, in trust for subscriber’s benefit, pending release to the Company. If the Company does not raise gross proceeds of $13,900,000 prior to the termination of this Offering, the Company will promptly return all funds in the escrow account without interest. The term “Offering” refers to the offer of Shares pursuant to this Offering Circular. 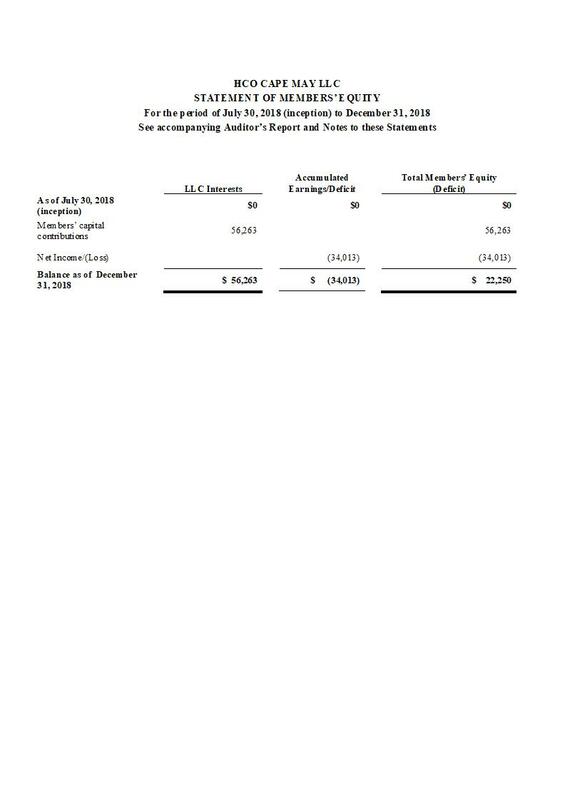 The Shares are being offered and sold by HCo Cape May LLC, a Delaware Limited Liability Company (“HCo Cape May”, we”, “our” or the “Company”). There are 70,000 Shares being offered at a price of $500.00 per Share with a minimum purchase of five (5) Shares per investor. The Shares are being offered on a minimum-maximum best efforts basis to an unlimited number of accredited investors and an unlimited number of non-accredited investors only by the Company and through North Capital Private Securities Corporation (“NCPS”), a broker/dealer registered with the Securities and Exchange Commission (the “SEC”) and a member of the Financial Industry Regulatory Authority (“FINRA”). The maximum aggregate amount of the Shares offered is $35,000,000.00 (the “Maximum Offering”). The Company was formed as HCo Cape May LLC, a Delaware limited liability company, on or about July 30, 2018. The Company was formed for the general purpose of developing a hotel in Cape May, New Jersey, and for any other lawful purpose. The Shares are being offered pursuant to Regulation A of Section 3(b) of the Securities Act of 1933, as amended, for Tier 2 offerings. The Shares will only be issued to purchasers who satisfy the requirements set forth in Regulation A. This Offering will commence after qualification by the Commission and is expected to expire on the first of: (i) all of the Shares offered are sold; or (ii) the close of business 180 days from the date of qualification by the Commission, unless sooner terminated or extended by the Company’s CEO, or (iii) the date upon which a determination is made by the Company to terminate the Offering in the Company’s sole and absolute discretion. Pending each closing, payments for the Shares will be deposited into an escrow account held by the escrow agent, North Capital, in trust for the subscriber’s benefit. If the Company does not raise gross proceeds of $13,900,000 prior to the termination of this Offering, all funds in the escrow account will be returned without interest. Funds will also be promptly refunded without interest, for sales that are not consummated. All funds received shall be held only in a non-interest-bearing escrow account. Upon closing under the terms as set out in this Offering Circular, funds will be immediately transferred to the Company where they will be available for use in the operations of the Company’s business in a manner consistent with the “Use Of Proceeds” in this Offering Circular. The Company’s website is not incorporated into this Offering Circular. TO GIVE ANY INFORMATION OR TO MAKE ANY REPRESENTATIONS CONCERNING THE COMPANY OTHER THAN THOSE CONTAINED IN THIS OFFERING CIRCULAR, AND IF GIVEN OR MADE, SUCH OTHER INFORMATION OR REPRESENTATION MUST NOT BE RELIED UPON. BEFORE INVESTING IN THIS OFFERING, PLEASE REVIEW ALL DOCUMENTS CAREFULLY, ASK ANY QUESTIONS OF THE COMPANY’S MANAGEMENT THAT YOU WOULD LIKE ANSWERED AND CONSULT YOUR OWN COUNSEL, ACCOUNTANT AND OTHER PROFESSIONAL ADVISORS AS TO LEGAL, TAX AND OTHER RELATED MATTERS CONCERNING THIS INVESTMENT. THERE IS NO PUBLIC MARKET FOR THE SHARES OR ANY OTHER SECURITIES OF THIS COMPANY, NOR WILL ANY SUCH MARKET DEVELOP AS A RESULT OF THIS OFFERING. A LEGALLY COMPLIANT TRADING MARKET FOR THE SHARES MAY NEVER BE DEVELOPED. AN INVESTMENT IN THIS OFFERING IS HIGHLY SPECULATIVE, AND YOU SHOULD ONLY INVEST IF YOU ARE PREPARED TO LOSE YOUR ENTIRE INVESTMENT. THE SHARES ARE OFFERED BY THE COMPANY SUBJECT TO THE COMPANY’S RIGHT TO REJECT ANY TENDERED SUBSCRIPTION, IN WHOLE OR IN PART, IN ITS ABSOLUTE DISCRETION, AT ANY TIME PRIOR TO THE ISSUANCE OF THE SHARES. THE COMPANY MAY REJECT ANY OFFER IN WHOLE OR IN PART AND NEED NOT ACCEPT OFFERS IN THE ORDER RECEIVED. INVESTORS WILL BE REQUIRED TO REPRESENT THAT THEY ARE ABLE TO BEAR THE ECONOMIC RISK OF THEIR INVESTMENT AND THAT THEY (OR THEIR PURCHASER REPRESENTATIVES) ARE FAMILIAR WITH AND UNDERSTAND THE TERMS AND RISKS OF THIS OFFERING. THE CONTENTS OF THIS OFFERING CIRCULAR ARE NOT TO BE CONSTRUED AS LEGAL OR TAX ADVICE. EACH INVESTOR SHOULD CONSULT HIS OR HER OWN ATTORNEY, ACCOUNTANT OR BUSINESS ADVISOR AS TO LEGAL, TAX AND RELATED MATTERS CONCERNING THIS INVESTMENT. ALL FINAL DECISIONS IN RESPECT TO SALES OF SECURITIES WILL BE MADE BY THE COMPANY, WHICH RESERVES THE RIGHT TO REVOKE THE OFFER AND TO REFUSE TO SELL TO ANY PROSPECTIVE INVESTOR. NO OFFERING LITERATURE OR ADVERTISING IN ANY FORM SHOULD BE RELIED ON IN CONNECTION WITH THE OFFERING EXCEPT FOR THIS OFFERING CIRCULAR, ANY EXHIBITS ATTACHED AND THE STATEMENTS CONTAINED IN BOTH. NO PERSONS, EXCEPT THE COMPANY OR ITS AGENTS AND SUCH REGISTERED BROKER-DEALERS AS THE COMPANY MAY ELECT TO UTILIZE, HAVE BEEN AUTHORIZED TO GIVE ANY INFORMATION OR TO MAKE ANY REPRESENTATION NOT CONTAINED IN THIS MEMORANDUM AND IF GIVEN OR MADE, SUCH INFORMATION OR REPRESENTATION MUST NOT BE RELIED UPON AS HAVING BEEN AUTHORIZED BY THE COMPANY. NEITHER THE DELIVERY OF THIS OFFERING CIRCULAR NOR ANY SALE HEREUNDER SHALL UNDER ANY CIRCUMSTANCES CREATE THE IMPLICATION THERE HAS BEEN NO CHANGE IN THE INFORMATION CONTAINED HEREIN SUBSEQUENT TO THE DATE HEREOF. THE INVESTMENT DESCRIBED IN THIS OFFERING CIRCULAR INVOLVES RISK AND IS OFFERED ONLY TO INDIVIDUALS WHO CAN AFFORD TO ASSUME SUCH RISKS FOR AN INDEFINITE PERIOD OF TIME AND WHO AGREE TO PURCHASE THE SECURITIES THAT ARE BEING OFFERED HEREUNDER ONLY FOR INVESTMENT PURPOSES AND NOT WITH A VIEW TOWARDS A TRANSFER, RESALE, EXCHANGE OR FURTHER DISTRIBUTION OF SUCH. FEDERAL LAW AND STATE SECURITIES LAWS LIMIT THE RESALE OF SUCH SECURITIES AND IT IS THEREFORE URGED THAT EACH POTENTIAL INVESTOR SEEK COUNSEL CONCERNING SUCH LIMITATIONS. THE COMPANY AS DESCRIBED IN THIS OFFERING CIRCULAR HAS ARBITRARILY DETERMINED THE PRICE OF SECURITIES, AND EACH PROSPECTIVE INVESTOR SHOULD MAKE AN INDEPENDENT EVALUATION OF THE FAIRNESS OF SUCH PRICE UNDER ALL THE CIRCUMSTANCES AS DESCRIBED IN THIS OFFERING CIRCULAR. THIS OFFERING CIRCULAR DOES NOT KNOWINGLY CONTAIN ANY UNTRUE STATEMENT OF A MATERIAL FACT OR OMIT A MATERIAL FACT, AND ANY SUCH MISSTATEMENT OR OMISSION IS DONE WITHOUT THE KNOWLEDGE OF THE PREPARERS OF THIS DOCUMENT OR THE COMPANY. AS SUCH, THE COMPANY BELIEVES THAT THIS OFFERING CIRCULAR CONTAINS A FAIR SUMMARY OF THE TERMS OF ALL MATTERS, DOCUMENTS AND CIRCUMSTANCES MATERIAL TO THIS OFFERING. HEREIN OR OTHERWISE PROVIDED TO A POTENTIAL INVESTOR MUST BE VIEWED ONLY AS ESTIMATES. ALTHOUGH ANY PROJECTIONS ARE BASED UPON ASSUMPTIONS, WHICH THE COMPANY BELIEVES TO BE REASONABLE, THE ACTUAL PERFORMANCE OF THE COMPANY WILL DEPEND UPON FACTORS BEYOND THE CONTROL OF THE COMPANY. NO ASSURANCE CAN BE GIVEN THAT THE COMPANY’S ACTUAL PERFORMANCE WILL MATCH THE PROJECTIONS. BEFORE INVESTING IN THIS OFFERING, PLEASE REVIEW ALL DOCUMENTS CAREFULLY, ASK ANY QUESTIONS OF THE COMPANY’S MANAGEMENT THAT YOU WOULD LIKE ANSWERED AND EACH PROSPECTIVE INVESTOR SHOULD CONSULT WITH HIS OR HER OWN PROFESSIONAL TAX, LEGAL AND INVESTMENT ADVISORS TO ASCERTAIN THE MERITS AND RISKS OF INVESTING IN THE SHARES DESCRIBED IN THIS OFFERING CIRCULAR PRIOR TO SUBSCRIBING TO SECURITIES OF THE COMPANY. FOR RESIDENTS OF ALL STATES: THE PRESENCE OF A LEGEND FOR ANY GIVEN STATE REFLECTS ONLY THAT A LEGEND MAY BE REQUIRED BY THAT STATE AND SHOULD NOT BE CONSTRUED TO MEAN AN OFFER OR SALE MAY BE MADE IN A PARTICULAR STATE. IF YOU ARE UNCERTAIN AS TO WHETHER OR NOT OFFERS OR SALES MAY BE LAWFULLY MADE IN ANY GIVEN STATE, YOU ARE HEREBY ADVISED TO CONTACT THE COMPANY. THE SECURITIES DESCRIBED IN THIS OFFERING CIRCULAR HAVE NOT BEEN REGISTERED UNDER ANY STATE SECURITIES LAWS (COMMONLY CALLED "BLUE SKY" LAWS). LAWS, PURSUANT TO REGISTRATION OR EXEMPTION THEREFROM. INVESTORS SHOULD BE AWARE THAT THEY WILL BE REQUIRED TO BEAR THE FINANCIAL RISKS OF THIS INVESTMENT FOR AN INDEFINITE PERIOD OF TIME. statements as a result of various factors. They involve risks, uncertainties (many of which are beyond the Company's control) and assumptions. are based on reasonable assumptions, you should be aware that many factors could affect its actual operating and financial performance and cause its performance to differ materially from the performance anticipated in the forward-looking statements. Should one or more of these risks or uncertainties materialize, or should any of these assumptions prove incorrect or change, the Company's actual operating and financial performance may vary in material respects from the performance projected in these forward-looking statements. These forward-looking statements come within safe harbors created by the PSLRA in Section 7A of the Securities Act and Section 1E of the Exchange Act. Any forward-looking statement made by the Company in this Offering Circular or any documents incorporated by reference herein speak only as of the date of this Offering Circular or any documents incorporated by reference herein. Factors or events that could cause the Company’s actual operating and financial performance to differ may emerge from time to time, and it is not possible for the Company to predict all of them. The Company disclaims any obligation, and undertakes no obligation, to update or alter any forward-looking statement, whether as a result of new information, future events/developments or otherwise or to conform these statements to actual results. whether as a result of new information, future events or otherwise. You should not place undue reliance on forward-looking statements. The Company urges you to carefully consider these matters, and the risk factors described in this Offering Circular, prior to making an investment in its Shares. A and Offering Circular is accurate only as of the date of this Form 1-A and Offering Circular, regardless of the time of delivery of this Form 1-A and Offering Circular. Our business, financial condition, results of operations, and prospects may have changed since that date. Statements contained herein as to the content of any agreements or other documents are summaries and, therefore, are necessarily selective and incomplete and are qualified in their entirety by the actual agreements or other documents. The Company will provide the opportunity to ask questions of and receive answers from the Company's management concerning terms and conditions of the Offering, the Company or any other relevant matters and any additional reasonable information to any prospective investor prior to the consummation of the sale of the Shares. This Form 1-A and Offering Circular do not purport to contain all of the information that may be required to evaluate the Offering and any recipient hereof should conduct its own independent analysis. The statements of the Company contained herein are based on information believed to be reliable. No warranty can be made as to the accuracy of such information or that circumstances have not changed since the date of this Form 1-A and Offering Circular. The Company does not expect to update or otherwise revise this Form 1-A, Offering Circular or other materials supplied herewith. The delivery of this Form 1-A and Offering Circular at any time does not imply that the information contained herein is correct as of any time subsequent to the date of this Form 1-A and Offering Circular. This Form 1-A and Offering Circular are submitted in connection with the Offering described herein and may not be reproduced or used for any other purpose. $13,900,000.00. Until the minimum of $13,900,000.00 of Shares are sold, all subscription payments will be placed in an account held by the escrow agent, North Capital, in trust for subscriber’s benefit, pending release to the Company. If the Company does not raise gross proceeds of $13,900,000 prior to the termination of this Offering, the Company will promptly return all funds in the escrow account without interest. $35,000,000.00 The Company will not accept investments greater than the Maximum Offering amount. Purchasers may be accredited investors or non-accredited investors. Non-accredited investors are limited in the number of Shares they may purchase. 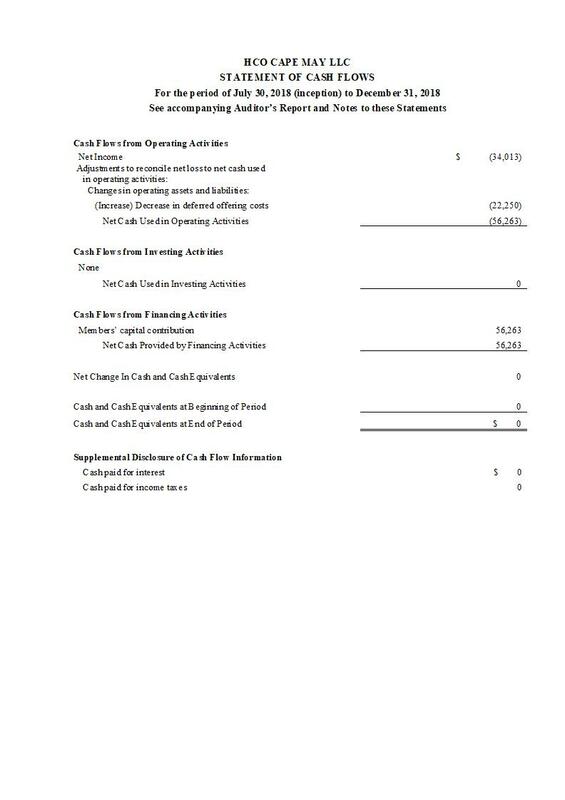 See the description in section entitled “Use of Proceeds” on page 37 herein. The Shares have extremely limited voting rights. See “Voting Rights” section of “Securities Being Offered” below for details. Shares will be offered on a continuous basis until either (a) the date upon which the escrow agent confirms that it has received in the escrow account gross proceeds of $35,000,000.00 in deposited funds; (b) the expiration of 180 days from the date of this Offering Circular unless extended in its sole discretion by the Company; or (c) the date upon which a determination is made by the Company to terminate the Offering in its sole discretion. On all accommodations booked directly with the hotel, investors will receive a 1% discount off the standard published room rate for each $500.00 invested, up to a total of 20% discount per hotel booking. On all food and beverage purchased by an investor at the hotel, investors will receive a 0.5% discount off the menu pricing for each $500.00 invested, up to a total of 10% discount on the food and beverage purchase. Any investor who purchases 500 shares or more will receive a one/quarter page write up (and photograph if acceptable by both parties) about them, written by the author and final approval by investor. Alternatively the investor may elect to just have their name published. Any investor who purchases 100 shares up to 499 shares will receive a one/sixteenth page write up about them (which may include a photograph if acceptable by both parties), written by the author and final approval by investor. Alternatively the investor may elect to just have their name published. Any investor who purchases 50 shares up to 99 shares will have their name published in the book if the investor provides approval for publication of their name at the sole discretion of the investor. It is intended that the book will be on display in the hotel and available to purchase by investors as well as guests. The Company will invite the 20 investors who invest the most amount of money to stay at The Ewing hotel in the weeks leading up to the hotel’s opening before it is available to the general public. The stay will include two nights of accommodations in a standard room. Investors who have invested the most amount of money will have first selection of nights. (1) There are two classes of Shares issued by the Company: Voting Shares and Non-Voting Shares. For a full description of the rights of the Shares, please see the section of this Offering Circular entitled “Securities Being Offered” below. The total number of Non-Voting Shares (70,000) in the chart assumes that the maximum number of Shares are sold in this Offering. (2) The total number of Shares to be outstanding after the Offering assumes that the Offering is fully subscribed, and this number will be less if the Offering is not fully subscribed. The Company may not be able to sell the Minimum Offering amount or the Maximum Offering amount. The Company will conduct one or more closings on a rolling basis as funds are received from investors, with the first closing not to occur prior to $13,900,000.00 in investment funds being received. Funds tendered by investors will be kept in an escrow account until the next closing after they are received by the escrow agent. At each closing, with respect to subscriptions accepted by the Company, funds held in escrow will be distributed to the Company, at which time the Shares will be issued to each investor. Investors may not withdraw their funds tendered from escrow unless the Offering is terminated without a closing having occurred. Investors are not entitled to any refund of funds transmitted by any means to the Company, or to the escrow account, for any reason, unless the Investor does not clear compliance by the broker-dealers involved. The Cape May property will be the Company’s only initial real estate asset so the Company’s business is greatly exposed to the risks associated with that asset. The Company will be subject to the operating risks common in the hospitality industry. The Company is a relatively newly formed entity with limited tangible assets and its continued operation requires substantial additional funding. The Company has a very short operating history and there is no assurance that the business plan can be executed, or that the Company will generate revenues or profits. Investors in this Offering risk the loss of their entire investment. The industry in which the Company is participating is highly speculative and extremely risky. There is no minimum number of Shares that needs to be sold in order for funds to be released to the Company and for this Offering to close; therefore, there is no assurance the Company will receive funds sufficient to further its business plan. If you invest and purchase the Shares, you will be acquiring a minority interest in the Company and will have no effective control over, or input into, the management or decisions of the Company, primarily because the Shares have no voting rights. There is no market for the Company’s Shares at present and there is no assurance such a market will develop subsequent to this Offering. The Shares are illiquid and should be considered a long-term investment. not be able to liquidate some or all of your investment in the immediate future. The Company has broad discretion in its use of proceeds and, as an investor, you are relying on management’s judgment. The price of the Shares is arbitrary and may not be indicative of the value of the Shares or the Company. The Company does not expect there to be any market makers to develop a trading market in the Shares. For a more detailed discussion of these and other significant risks, please thoroughly review and understand “Risk Factors” in the main body of this Offering Circular. Potential investors will be given an opportunity, if the potential investor requests to do so, to review the current status of all material contracts and make appropriate questions of management prior to subscribing to this Offering. 1.Management believes that the trends for growth in the hotel industry in the United States are favorable. 2. The demand for hotels in the United States is expected to grow, creating an opportunity for the Company. 3. Management believes that its experience in the hotel market will position HCo Cape May for profitable operations. 4.Management believes that the hotel operating partner have the experience in the hotel industry required to achieve strong brand recognition and profitable operations. 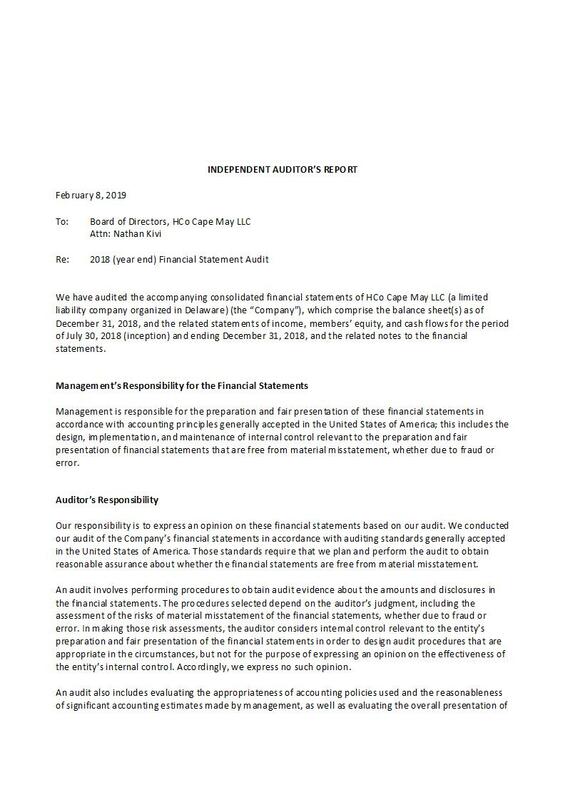 Despite management’s beliefs, there is no assurance that HCo Cape May will be profitable, or that management’s opinion of the industry’s favorable dynamics will not be outweighed in the future by unanticipated losses, adverse regulatory developments and other risks. Investors should carefully consider the various risk factors below before investing in the Shares. The purchase of the Company’s Shares involves substantial risks. You should carefully consider the following risk factors in addition to any other risks associated with this investment. The Shares offered by the Company constitute a highly speculative investment and you should be in an economic position to lose your entire investment. The risks listed do not necessarily comprise all those associated with an investment in the Shares and are not set out in any particular order of priority. Additional risks and uncertainties may also have an adverse effect on the Company’s business and your investment in the Shares. An investment in the Company may not be suitable for all recipients of this Offering Circular. You are advised to consult an independent professional adviser or attorney who specializes in investments of this kind before making any decision to invest. You should consider carefully whether an investment in the Company is suitable in the light of your personal circumstances and the financial resources available to you. The Company is, in addition to the risks set out below, subject to all the same risks that all companies in its business, and all companies in the economy, are exposed to. These include risks relating to economic downturns, political and economic events and technological developments (such as hacking and the ability to prevent hacking). Additionally, early-stage companies and companies that rely on a single asset inherently involve greater risk than more developed companies or companies with a more diversified business plan. You should consider general risks as well as specific risks when deciding whether to invest. The Cape May Property Will Be The Company’s Only Initial Real Estate Asset So The Company’s Business Is Greatly Exposed To The Risks Associated With That Asset. Upon completion of this offering, the investment will be concentrated in a single asset—the Cape May property and hotel described herein. The Company’s business could be materially adversely affected by harm or damage to this property or its reputation in a way that cannot be quickly resolved and remedied. This concentration of risk in a single asset exposes the Company to greater risks than if the Company was more diversified. The Value Of The Cape May Property May Be Lower On Settlement Than The Agreed Strike Price. The settlement price for the two Cape May properties was determined by an independent company, HVS Valuations, as at June 1, 2018. The property may not transact until December 2019. Although the price of the land was deemed market value by HVS Valuations at June 1, 2018, the value of the land may be lower at the time the Purchase and Sale Agreement is effectuated. The Company Will Be Subject To The Operating Risks Common In The Hospitality Industry. changes in operating costs including, but not limited to, energy, water, labor costs (including the impact of labor shortages and unionization), food costs, workers’ compensation and health-care related costs, insurance and unanticipated costs such as acts of nature and their consequences. changes in exchange rates or economic weakness in the United States (affecting domestic travel) and internationally could also unfavorably impact future results. These factors, and the reputational repercussions of these factors, can adversely affect, and from time to time have adversely affected, individual hotels, particular regions or the lodging industry as a whole. How the Company manages any one or more of these factors, or any crisis, could limit or reduce demand for the Company’s hotel, or the rates charged for rooms or services. Because The Company Operates In A Highly Competitive Industry, The Company’s Revenues, Profits Or Market Share Could Be Harmed If The Company Is Unable To Compete Effectively, And Alternatives To Traditional Hotels And Industry Consolidation Among The Company’s Competitors May Negatively Impact The Company’s Business. The hospitality industry is highly competitive. The Company will compete with others including major hospitality chains with well-established and recognized reputations. Some competitors to the Company’s hotel will have substantially greater marketing and financial resources than the Company’s hotel, and they may construct new facilities or improve their existing facilities, reduce their prices or expand and improve their marketing programs in ways that adversely affect the Company’s hotel’s ability to compete for guests effectively and the Company’s operating results and financial condition. In addition to these competitors, the Company’s hotel will also compete against smaller hotel chains and other independent and local hotel owners and operators. Additionally, the Company’s hotel will face competition from multiple channels of distribution in the hospitality industry, including peer-to-peer inventory sources that allow travelers to book stays on websites that facilitate the short-term rental of homes and apartments from owners, such as Airbnb and HomeAway. Since a significant portion of the Company’s revenue will be derived from room revenues, the Company’s prospects for growth are largely dependent upon the ability of the Company’s hotel to compete in the lodging market. The Company May Lose Business Due To Unsuccessful Operation Of The Hotel By The Hotel Management Company. The hotel will be operated by a hotel management company. The management company may not run the hotel successfully even if the hotel market is doing well. Poor performance by the hotel management company would adversely affect the Company’s results. The Company May Lose Business By Failing To Compete Effectively And/Or Because Of Negative Social Media. The Company competes with other lodging companies for room bookings. If the Company fails to compete effectively with other lodging companies and alternatives to traditional hotel room bookings, the Company may lose business and your investment may be affected. The growing use of social and digital media by consumers, the Company, our competitors and third parties increases the speed and extent that information or misinformation and opinions can be shared. Negative posts or comments about the Company, our hotel and/or our location on social or digital media could seriously damage our business, and reputation and loyalty, regardless of the information’s accuracy. The harm may be immediate without affording the Company an opportunity for redress or correction. The Company’s reputation and customer loyalty can also be impacted by the effectiveness of the Company’s advertising campaigns, marketing programs and sponsorships, as well as the Company’s use of social media. If the Company does not maintain the favorable perception of the Company’s hotel, the Company’s results could be negatively impacted. The Hospitality Industry Is Cyclical And A Worsening Of Global Economic Conditions Or Low Levels Of Economic Growth Could Adversely Affect The Company’s Revenues And Profitability As Well As Cause A Decline In Or Limitation Of The Company’s Future Growth. The hospitality industry is cyclical and consumer demand for the Company’s products and services is closely linked to the performance of the general economy and is sensitive to business and personal discretionary spending levels. Declines in consumer demand due to adverse general economic conditions, risks affecting or reducing travel patterns, lower consumer confidence and high unemployment or adverse political conditions can lower the amount of revenues we are able to generate from the Company’s hotel. As a result, changes in consumer demand and general business cycles could adversely affect the Company’s revenues, earnings and results of operations. In addition, the expenses of hotels including personnel costs, interest, property taxes, insurance and utilities, all of which may increase at a greater rate than revenues of the Company’s hotel and the Company’s hotel may not be able to reduce such expenses at the same rate as declining revenues. When the Company’s hotel’s cost-cutting efforts are insufficient to offset any declines in revenues as a result of economic contraction, slow economic growth or changes in travel patterns, the Company could experience a material decline in margin and reduced or negative cash flows. These factors, among others, could adversely affect the operating results and financial condition of the Company’s hotel and result in declines in the revenues derived from the Company’s business. Macroeconomic And Other Factors Beyond The Company’s Control Can Adversely Affect And Reduce Demand For Its Products And Services. cyclical over-building in the hotel and timeshare industries. Any one or more of these factors could limit or reduce overall demand for the Company’s products and services or could negatively impact the Company’s revenue sources, which could adversely affect the Company’s business, financial condition and results of operations. Although Valor Hospitality Partners is an experienced and capable full and select service hospitality management company, its experience in day-to-day hotel management is primarily concentrated in the United Kingdom, Africa and certain areas of the U.S. Valor Hospitality Partners has limited experience managing full service hotels in Cape May and in New Jersey generally and, therefore, may encounter certain challenges in relation thereto. The Company’s assets, including any investments made by the Company and any capital held by the Company, are available to satisfy all liabilities and other obligations of the Company. Increasing Use By Consumers Of Alternative Internet Reservation Channels May Decrease The Company’s Bookings And Revenues. A significant, and increasing, percentage of hotel rooms are booked through internet travel intermediaries. If these intermediaries are successful in continuing to increase their share of bookings, these intermediaries may be able to obtain higher commissions, reduced room rates or other significant contractual and operational concessions from the Company’s hotel. Moreover, some of these internet travel intermediaries hope that consumers will eventually develop brand loyalties to their reservations systems and the Company’s larger competitors with more hotels and greater spending power may receive preferential treatment from these travel intermediaries. Some of the Company’s competitors may have substantially greater marketing and financial resources than the Company’s hotel, which may result in these competitors obtaining more favorable pricing terms from internet reservation channels. As a result, the Company’s hotel’s ability to compete for guests effectively and the Company’s operating results and financial condition could be adversely affected. Company’s hotel is not available through one or more of such intermediaries. Relatedly, the Company may not be able to negotiate mutually acceptable agreements or renegotiate extensions of agreements with existing internet travel intermediaries upon their expiration, and any such renegotiated or extended agreement may not be entered into on terms as favorable as the provisions that existed before such expiration, replacement or renegotiation. The Company’s Hotels Will Be Reliant Upon Technology And The Disruption Or Malfunction In The Company’s Information Systems Could Adversely Affect The Company’s Business. The hospitality industry depends upon the use of sophisticated technology and systems to process, transmit and store electronic information, including those utilized for reservations, property management, procurement, hotel revenue management, and the Company’s administrative systems. Consequently, disruptions or malfunctions in technology can impact the Company’s revenue. The operation of many of these systems is dependent upon third party data communication networks and software upgrades, maintenance and support. Furthermore, a significant portion of the communications between, and storage of personal data of, the Company’s personnel, customers, and suppliers depends on information technology. The Company’s information technology systems, and the systems of the parties the Company communicates and collaborates with, may be vulnerable to a variety of interruptions due to events beyond the Company’s control, including, but not limited to, network or hardware failures, malicious or disruptive software, unintentional or malicious actions of employees or contractors, cyberattacks by common hackers, criminal groups or nation-state organizations or social-activist (hacktivist) organizations, geopolitical events, natural disasters, failures or impairments of telecommunications networks, or other catastrophic events. Accordingly, an extended interruption in the ability of any system to function could significantly curtail, directly and indirectly, the Company’s ability to conduct its business and generate revenue. The Company’s information technology systems can be expected to require refinements and there is the risk that advanced new technologies will be introduced. There can be no assurance that as various systems and technologies become outdated or new technology is required, the Company will be able to replace or introduce them as quickly as the Company’s competitors or within budgeted costs for such technology. There can be no assurance that the Company will achieve the benefits that may have been anticipated from any new technology or system. Further, there can be no assurance that disruptions of the operation of these systems will not occur as a result of failures related to the Company’s internal or third-party systems and support. The Company Is Subject To Risks Related To Cybersecurity. technology, they may be insufficient to prevent physical and electronic break-ins, cyber-attacks or other security breaches to the Company’s computer systems. In addition, the Company could experience cyber-attacks, privacy breaches, data breaches or other incidents that result in unauthorized disclosure of customer, employee or Company information. If the Company suffers a loss as a result of a breach or other breakdown in the Company’s technology, including such cyber-attack, privacy breaches, data breaches or other incident involving one of the Company’s vendors, that result in unauthorized disclosure or significant unavailability of business, financial, personal or stakeholder information, the Company may suffer reputational, competitive and/or business harm and may be exposed to legal liability, which may adversely affect the Company’s results of operations and/or financial condition. The misuse, leakage or falsification of information could result in violations of data privacy laws, the Company may become subject to legal action and increased regulatory oversight. The Company could also be required to spend significant financial and other resources to remedy the damage caused by a security breach or to repair or replace networks and information systems. In addition, if the Company’s suppliers or customers experience such a breach or unauthorized disclosure or system failure, their businesses could be disrupted or otherwise negatively affected, which may result in a disruption in the Company’s supply chain, which could adversely affect the Company’s business operations. The Company seeks to minimize the impact of these attacks through various technologies, processes and practices designed to help protect the Company’s networks, systems, computers and data from attack, damage or unauthorized access. However, there are no guarantees that the Company’s cyber-security practices will be sufficient to thwart all attacks. While the Company may carry cyber breach, property and business operation interruption insurance, the Company may not be sufficiently compensated for all losses it may incur. These losses include not only a loss of revenues but also potential reputational damage to the Company’s brand and litigation, fines or regulatory action against the Company. Furthermore, the Company may also incur substantial remediation costs to repair system damage as well as satisfy liabilities for stolen assets or information that may further reduce the Company’s profits. Failure To Maintain The Integrity Of Internal Or Customer Data Could Result In Faulty Business Decisions, Damage Of Reputation And/Or Subject The Company To Costs, Fines Or Lawsuits. The Company’s business requires the collection and retention of internal and customer data, including credit card numbers and other personally identifiable information of the Company’s employees and customers as such information is entered into, processed, summarized, and reported by the various information systems the Company uses. The integrity and protection of that customer, employee, and company data is critical to the Company. The Company’s customers have a high expectation that the Company will adequately protect their personal information, and the regulatory environment surrounding information security and privacy is increasingly demanding, both in the United States and in international jurisdictions. If the Company fails to maintain compliance with the various U.S. and international laws and regulations applicable to the protection of such data or with the Payment Card Industry (“PCI”) data security standards, the Company’s ability to process such data could be adversely impacted and expose the Company to fines, litigation or other expenses or sanctions. Damage To, Or Losses Involving, The Company’s Property May Not Be Covered By Insurance. The Company will maintain comprehensive property, general liability, and other insurance policies with coverage features and insured limits that the Company believes are customary. Market forces may nonetheless limit the scope of the insurance coverage the Company’s hotel can obtain or its ability to obtain coverage at reasonable rates. Certain types of losses, generally of a catastrophic nature, such as earthquakes, hurricanes and floods, or terrorist acts, or liabilities that result from breaches in the security of the Company’s information systems, may be uninsurable or too expensive to justify obtaining insurance above the required coverage amounts. As a result, the Company’s hotel may not be successful in obtaining insurance without increases in cost or decreases in coverage levels. In addition, in the event of a substantial loss, the insurance coverage the Company’s hotel may carry may not be sufficient to pay the full market value or replacement cost of any lost investment or in some cases could result in certain losses being totally uninsured. Changes In Privacy Laws Could Adversely Affect The Company’s Ability To Utilize Guest Data And Market Our Hotel Effectively And Could Impact The Company’s Results From Operations Or Result In Costs And Fines. The Company’s business operations are subject to various U.S. and international privacy and data protection laws. Any future changes or restrictions in United States or international privacy and data protection laws could adversely affect the Company’s operations, including the Company’s ability to utilize guest data, which could adversely impact guest bookings. Compliance with such future changes or restrictions could result in significant costs. Failure to comply could expose the Company to fines, litigation, or other expenses or sanctions. The Company may also rely on a variety of direct marketing techniques, including telemarketing, email, online marketing and postal mailings. Any future restrictions in laws such as Telemarketing Sales Rule, CANSPAM Act, and various U.S. state and international laws, or new federal laws regarding marketing and solicitation or international data protection laws that govern these activities could adversely affect the continuing effectiveness of telemarketing, email and postal mailing techniques and could force changes in the Company’s marketing strategies. If this occurs, the Company may not be able to develop adequate alternative marketing strategies, which could impact the amount and timing of the Company’s revenues. The Company may also obtain access to potential customers from travel service providers and other companies with whom the Company has relationships and market to some individuals on these lists directly or by including the Company’s marketing message in the other company’s marketing materials. If access to these lists was prohibited or otherwise restricted, the Company’s ability to develop new customers and introduce them to the Company’s hotel could be impaired. the Company will ever realize any significant operating revenues or that its operations will ever be profitable. The Company's success is heavily dependent upon the continued active participation of the Company's current executive officers as well as other key personnel and consultants. Some of them will have concurrent responsibilities at other entities. Loss of the services of one or more of these individuals could have a material adverse effect upon the Company's business, financial condition or results of operations. The success of the Company’s hotel and therefore the repayment of each subscriber’s investment depend in substantial part upon the skill and expertise of the key personnel of the Company, and related parties such as Valor Hospitality Partners, LLC and the other individuals employed to assist them. There can be no assurance that these key personnel or such other individuals will continue to be associated with the Company’s hotel. The loss of the services of one or more of these key personnel or such other individuals could have a material adverse effect on the Company’s hotel. The quality of individuals hired for positions in the hotel operations will be critical to the success of the Company’s hotel. It may be difficult to attract, retain and train qualified employees due to the competition for employees with other companies and facilities in and around New Jersey. The Company cannot assure potential subscribers that the Company’s hotel will be successful in hiring or retaining qualified personnel in the future. A failure to attract or retain qualified management and personnel at all levels could have a material adverse effect on the Company’s financial condition and results of operations. None of the project participants are required to devote his or her full time to the Company or the Company’s hotel; they are all free to engage in other business activities, including activities that compete with the business of the Company. Any fees, compensation or other amounts payable to the project participants and any of their affiliates from any other business activities will inure solely to the benefit of those persons. The Company is dependent upon management in order to conduct its operations and execute its business plan, however, the Company has not purchased any insurance policies with respect to those individuals in the event of their death or disability. Therefore, should any of these key personnel, management or consultants die or become disabled, the Company will not receive any compensation that would assist with such person's absence. The loss of such person could negatively affect the Company and its operations. Investing in businesses operated on real property involves risks relating to hazardous and toxic contamination of such property or adjacent property, including subsurface and underground water contamination. Contamination could have a detrimental effect on the property the Company plans to develop, and can result from the actions of tenants, contractors, patrons, visitors, and other parties, including adjacent property owners, over whom the Company may not be able exercise much, if any, control. The Company could be required to participate financially in the clean up or other abatement of such contamination, which could cause the loss of some or all of the capital invested in the Company. The Company Is Subject to Income Taxes as Well As Non-Income Based Taxes, Which May Include Payroll, Sales, Use, Value-Added, Net Worth, Property and Goods and Services Taxes. Significant judgment is required in determining the Company’s provision for income taxes and other tax liabilities. In the ordinary course of the Company’s business, there are many transactions and calculations where the ultimate tax determination is uncertain. Although the Company believes that the Company’s tax estimates will be reasonable: (i) there is no assurance that the final determination of tax audits or tax disputes will not be different from what is reflected in the Company’s income tax provisions, expense amounts for non-income based taxes and accruals and (ii) any material differences could have an adverse effect on the Company’s financial position and results of operations in the period or periods for which determination is made. The Company does not have the internal infrastructure necessary, and is not required, to complete an attestation about the Company’s financial controls that would be required under the Sarbanes-Oxley Act of 2002. There can be no assurances that there are no significant deficiencies or material weaknesses in the quality of the Company’s financial controls. While the Company’s management believes the Company should face no impediments to obtaining, maintaining or extending all necessary permits, licenses, certificates and approvals required to operate the Company’s hotel, no assurance can be made that they will be maintained or extended. As such, there are no assurances that the business plan may not have to be modified accordingly, which may result in additional costs and delays. Construction on the hotel has not yet commenced. The Company’s current estimate to develop the Company’s hotel is accounted for in this Offering Circular; however, the Company’s hotel is currently in early stages, the construction budget and development schedule continue to be in process and there is no guarantee that the price ultimately paid to complete construction will be in the anticipated price range or that construction will be completed as scheduled. Cost overruns may be encountered as a result of numerous factors, including not only the necessity to make unanticipated modifications to design or other terms or the delay in the development process, but also the failure of certain contracted parties to complete their work in accordance with the contracted amount, necessitating the substitution of subcontractors and potential increases in pricing. Fluctuating prices of raw materials can also cause increases in pricing. Furthermore, unforeseen issues may be encountered that otherwise require an increase in the development budget that have not otherwise been reserved for in any contingency fund. There are no assurances that the construction budget and development schedule anticipated by the Company and any milestones can be satisfied, and if the timing for the completion of development is delayed by any significant degree, then development costs will increase accordingly. Any significant price increases or delays may have a material adverse effect on the success of the Company’s hotel. construction materials and labor may change to the detriment of the Company during the course of construction. Unanticipated cost increases may require raising additional capital, which may or may not be available, to complete construction of the Company’s hotel. In addition, failure to complete the Company’s hotel according to the original specifications or schedule, if at all, may give rise to potential liabilities and, as a result, the return on investment in the Shares may be different than originally expected. The Company Has Engaged in Certain Transactions with Related Persons or Entities. The Company has, and will continue to engage in transactions with related parties and/or entities. While the Company believes the terms of such transactions are fair and equitable, these other parties and/or entities may not be at arm’s length. 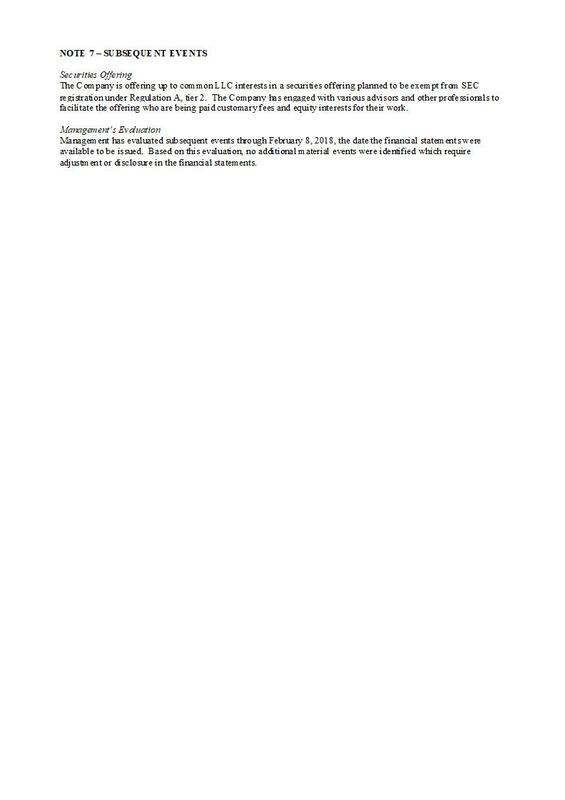 Please see the section of this Offering Circular entitled “Interest of Management and Others in Certain Related-Party Transactions and Agreements” for further details. If you have concerns about these transactions in the past or in the future, you may ask questions of the Company’s management. However, if you choose to invest in the Company, you will do so knowing and understanding that these transactions have occurred and will continue to occur in the future. The Company’s hotel may be subject to technical risks, including design errors, defects in construction and materials, mechanical breakdown, failure to perform according to design specifications and other unanticipated events, which adversely affect operations, health, safety and other equipment and/or facilities. While the Company’s hotel will be insured and it is expected that third parties will bear much of this risk, there can be no assurance that any or all such risk can be mitigated or that such parties, if present, will perform their obligations. Changes in Employment Laws or Regulation Could Harm the Company’s Performance. Various federal and state labor laws govern the Company’s relationship with the Company’s employees and contractors and affect the Company’s operating costs. These laws may include minimum wage requirements, overtime pay, healthcare reform and the implementation of various federal and state healthcare laws, unemployment tax rates, workers' compensation rates, citizenship requirements, union membership and sales taxes. A number of factors could adversely affect the Company’s operating results, including additional government-imposed increases in minimum wages, overtime pay, paid leaves of absence and mandated health benefits, mandated training for employees, changing regulations from the National Labor Relations Board and increased employee litigation including claims relating to the Fair Labor Standards Act. The Company’s regular bank accounts and the escrow account for this Offering each have federal insurance that is limited to a certain amount of coverage. It is anticipated that the account balances in each account may exceed those limits at times. In the event that any of the Company’s banks should fail, the Company may not be able to recover all amounts deposited in these bank accounts. The Company’s present business and planned business are speculative and subject to numerous risks and uncertainties. There is no assurance that the Company will generate significant revenues or profits. An investment in the Company’s Shares is speculative and there is no assurance that investors will obtain any return on their investment. Investors will be subject to substantial risks involved in an investment in the Company, including the risk of losing their entire investment. The Company may incur debt (including secured debt) in the future and in the continuing operations of its business. Complying with obligations under such indebtedness may have a material adverse effect on the Company and on your investment. The Company’s operating and other expenses could increase without a corresponding increase in revenues, which could have a material adverse effect on the Company’s financial results and on your investment. Factors which could increase operating and other expenses include, but are not limited to (1) increases in the rate of inflation, (2) increases in taxes and other statutory charges, (3) changes in laws, regulations or government policies which increase the costs of compliance with such laws, regulations or policies, (4) significant increases in insurance premiums, (5) increases in borrowing costs, and (5) unexpected increases in costs of supplies, goods, materials, construction, equipment or distribution. The Company's executive officers, directors and affiliates beneficially own or control the Company’s outstanding Shares that have voting rights, which may limit your ability and the ability of the Company’s other Shareholders, whether acting alone or together, to propose or direct the management or overall direction of the Company. Additionally, this concentration of ownership could discourage or prevent a potential merger or acquisition of the Company that might otherwise result in an investor receiving a premium over the market price for his or her Shares. Accordingly, the Company’s directors, executive officers and affiliate Shareholders have the power to control the election of the Company’s management and the approval of actions for which the approval of the Company’s Shareholders is required. If you acquire the Company’s Shares, you will have no effective voice in the management of the Company. Such concentrated control of the Company may adversely affect the value of the Company’s Shares and could also limit the price that investors might be willing to pay in the future for the Company’s Shares. Unfavorable changes in any of these or other factors, most of which are beyond the Company’s control, could materially and adversely affect its business, results of operations and financial condition. The Company has been operating at a loss since the Company's inception, and the Company expects to continue to incur losses for the foreseeable future. Further, the Company may not be able to generate significant revenues in the future. In addition, the Company expects to incur substantial operating expenses in order to fund the expansion of the Company's business. As a result, the Company expects to continue to experience substantial negative cash flow for at least the foreseeable future and cannot predict when, or even if, the Company might become profitable. The Company believes that increasing, maintaining and enhancing awareness of the Company's brand is critical to achieving widespread acceptance and success of the Company's business. Successfully promoting and positioning the hotel will depend largely on the effectiveness of the Company's marketing efforts. Maintaining and enhancing the Company's brand awareness may require the Company to spend increasing amounts of money on, and devote greater resources to, advertising, marketing and other brand-building efforts, and these investments may not be successful. Further, even if these efforts are successful, they may not be cost-effective. If the Company is unable to continuously maintain and enhance the Company's brand, the Company's market may decrease and the Company may fail to attract customers, which could in turn result in lost revenues and adversely affect the Company's business and financial results. The Company, like any business, is exposed to the risk of hotel employee or contractor fraud or other misconduct. Misconduct by hotel employees or contractors could include intentional failures to comply with laws or regulations, provide accurate information to regulators, comply with applicable standards, report financial information or data accurately or disclose unauthorized activities to the Company. In particular, sales, marketing and business arrangements are subject to extensive laws and regulations intended to prevent fraud, misconduct, kickbacks, self-dealing and other abusive practices. These laws and regulations may restrict or prohibit a wide range of pricing, discounting, marketing and promotion, sales commission, customer incentive programs and other business arrangements. Employee misconduct could also involve improper or illegal activities which could result in regulatory sanctions and harm to the Company's reputation. The Company may provide for the indemnification of managers, officers and others to the fullest extent permitted by law and, to the extent permitted by such law, eliminate or limit the personal liability of managers, officers and others to the Company and its Shareholders for monetary damages for certain breaches of fiduciary duty. Such indemnification may be available for liabilities arising in connection with this Offering. Insofar as indemnification for liabilities arising under the Securities Act may be permitted to managers, officers or others controlling or working with the Company pursuant to the foregoing provisions, the Company has been informed that in the opinion of the Securities and Exchange Commission such indemnification is against public policy as expressed in the Securities Act and is therefore unenforceable. Despite this, should the Company provide such indemnification, it could have a material adverse effect on the Company. It is important that the Company maintains and enhances the image of its hotel. The image and reputation of the Company’s hotel may be impacted for various reasons including but not limited to, bad publicity, litigation, customer complaints, and complaints from regulatory bodies. Such problems, even when unsubstantiated, could be harmful to the Company’s image and the reputation of its hotel. From time to time, the Company may receive complaints from customers regarding the hotel. The Company may become subject to lawsuits from customers alleging injury, claiming substantial damages and demanding payments from the Company. These claims may not be covered by the Company’s insurance policies, if any exist. Any resulting litigation could be costly for the Company, divert management attention, and could result in increased costs of doing business, or otherwise have a material adverse effect on the Company’s business, results of operations, and financial condition. Any negative publicity generated as a result of customer or regulator complaints about the Company or its hotel could damage the Company’s reputation and diminish the value of the Company’s brand and brand equity, which could have a material adverse effect on the Company’s business, results of operations, and financial condition, as well as your investment. There Are Doubts About the Company’s Ability to Continue as a Going Concern. or thereafter will be generated from operations or that funds will be available from external sources, such as debt or equity financings or other potential sources. The lack of additional capital resulting from the inability to generate cash flow from operations, or to raise capital from external sources would force the Company to substantially curtail or cease operations and would, therefore, have a material adverse effect on its business. Although the books have operating expenses, these are contemplated in the raise to be capitalized on successful development of the hotel. Since the Company is offering the Shares on a “minimum-maximum best efforts” basis, there is no assurance that the Company will sell enough Shares to meet its capital needs. If you purchase Shares in this Offering, you will do so without any assurance that the Company will raise enough money to satisfy the full Use of Proceeds which the Company has outlined in this Offering Circular or to meet the Company’s working capital needs. All funds delivered in connection with subscriptions for the Shares will be held in a non-interest-bearing escrow account until a closing of the Offering, if any. Investors in the securities offered hereby may not have the use of such funds or receive interest thereon pending the completion of the Offering or a closing. If the Company fails to hold a closing prior to the termination date, investor subscriptions will be returned without interest or deduction. The Company has never paid cash dividends on its Shares and does not anticipate paying cash dividends in the foreseeable future. The payment of dividends on the Company’s Shares will depend on earnings, financial condition and other business and economic factors affecting it at such time that management may consider relevant. If the Company does not pay dividends, the Company’s Shares may be less valuable. may never be a trading market available for the Shares and peer-to-peer trading may not be permitted. As a result, holders of Shares should be prepared to hold their Shares indefinitely. In the event that the Shares remain untradeable indefinitely, the value of the Shares would be materially adversely affected. In addition, even if a trading market develops, there is absolutely no assurance that the Shares could be sold under Rule 144 or otherwise unless the Company becomes a current public reporting company with the Securities and Exchange Commission and otherwise is current in the Company’s business, financial and management information reporting, and applicable holding periods have been satisfied. Should a market develop and the Company’s Shareholders sell substantial amounts of the Company’s Shares in the public market, the amount of Shares sold may cause the price to decrease below the current Offering price. This may also make it more difficult for the Company to sell future shares, equity or equity-related securities at a time and price that the Company deems reasonable or appropriate. adverse publicity and news coverage, inability to carry out marketing and sales plans, loss of key executives, changes in interest rates, inflationary factors, and other specific risks that may be referred to in this Offering Circular or in other reports issued by the Company or by third-party publishers. The Company has significant discretion over the net proceeds of this Offering. As is the case with any business, particularly one without a proven business model, it should be expected that certain expenses unforeseeable to management at this juncture will arise in the future. There can be no assurance that management's use of proceeds generated through this Offering will prove optimal or translate into revenue or profitability for the Company. You are urged to review the Use of Proceeds in this Offering Circular but to understand that the actual use of the net proceeds of this Offering may vary significantly. In all cases, you should consult with your attorneys, accountants and personal investment advisors prior to making any decision to invest in the Company. The price at which the Shares are being offered has been arbitrarily determined by the Company. There is no relationship between the Offering price and the Company’s assets, book value, net worth, or any other economic or recognized criteria of value. Rather, the price of the Shares was derived as a result of internal decisions based upon various factors including prevailing market conditions, the Company’s future prospects and needs, and the Company’s capital structure. These prices do not necessarily accurately reflect the actual value of the Shares or the price that may be realized upon disposition of the Shares, or at which the Shares might trade in a marketplace, if one develops. There is not now, and may never be, a public market for the Shares. Because the Shares are being sold under exemptions to registration, and therefore have not been registered under the Securities Act or under the securities laws of any state or non-United States jurisdiction, the Shares may have certain transfer restrictions. It is not currently contemplated that registration under the Securities Act or other securities laws will occur for the Shares. Limitations on the transfer of the Shares may also adversely affect the price that you might be able to obtain for the Shares in a sale in the future. Investors in the Company, therefore, will not receive any of the benefits that such registration would otherwise provide. You must assess the adequacy of disclosure and the fairness of the terms of this Offering on your own or in conjunction with your personal advisors. You should be aware of the long-term nature of your investment in the Company. Company, the Shares being offered do not provide you with any protection. In addition, there are no provisions attached to the Shares in the Offering that would permit you to require the Company to repurchase the Shares in the event of a takeover, recapitalization or similar transaction involving the Company. The Shares in this Offering are subject to tag along and drag along rights whereby the Company may, under certain circumstances, require you to sell your Shares if certain contingencies occur. For full details on the tag along and drag along rights, see the Company’s Operating Agreement attached to this Offering Circular. There is no assurance that you will realize a return on your investment or that you will not lose your entire investment. For this reason, you should read this Offering Circular and all Exhibits and referenced materials carefully and should consult with your own attorney and business advisor prior to making any investment decision. IN ADDITION TO THE RISKS LISTED ABOVE, BUSINESSES ARE OFTEN SUBJECT TO RISKS NOT FORESEEN OR FULLY APPRECIATED BY THE COMPANY’S MANAGEMENT. IT IS NOT POSSIBLE TO FORESEE ALL RISKS THAT MAY AFFECT THE COMPANY. MOREOVER, THE COMPANY CANNOT PREDICT WHETHER THE COMPANY WILL SUCCESSFULLY EFFECTUATE THE COMPANY'S CURRENT BUSINESS PLAN. EACH PROSPECTIVE INVESTOR IS ENCOURAGED TO CAREFULLY ANALYZE THE RISKS AND MERITS OF AN INVESTMENT IN THE SHARES AND SHOULD TAKE INTO CONSIDERATION WHEN MAKING SUCH ANALYSIS, AMONG OTHER FACTORS, THE RISK FACTORS DISCUSSED ABOVE, AS WELL AS OTHERS NOT DISCUSSED ABOVE. The term "dilution" refers to the reduction (as a percentage of the aggregate Shares outstanding) that occurs for any given Share when additional Shares are issued. If all of the Shares in this Offering are fully subscribed and sold, the Shares offered herein will constitute approximately 98.6% of the total Shares of the Company. The type of dilution that negatively affects early-stage investors most occurs when the Company sells more Shares or securities in a “down round,” meaning at a lower valuation than in earlier offerings. This type of dilution might also happen upon conversion of convertible notes into Shares. Typically, the terms of convertible notes issued by early-stage companies provide that in the event of another round of financing, the holders of the convertible notes get to convert their notes into equity at a “discount” to the price paid by the new investors, i.e., they get more Shares than the new investors would for the same price. Additionally, convertible notes may have a “price cap” on the conversion price, which effectively acts as a Share price ceiling. Either way, the holders of the convertible notes get more Shares for their money than would new investors in that subsequent round. In the event that the financing is a “down round” the holders of the convertible notes will dilute existing equity holders, and even more than the new investors do, because they get more Shares for their money. Investors should pay careful attention to the amount of convertible notes that a company has issued and may issue in the future, and the terms of those notes. At present, the Company has not issued any convertible notes, but it is possible that such notes could be issued in the future. If you are making an investment expecting to own a certain percentage of the Company or expecting each Share to hold a certain amount of value, it’s important to realize how the value of those Shares can decrease by actions taken by the Company. Dilution can make drastic changes to the value of each Share, ownership percentage, control, share of revenues and earnings per Share. If you invest in the Company’s Shares, your interest will be diluted immediately to the extent of the difference between the Offering price per Share and the pro forma net tangible book value per Share after this Offering. 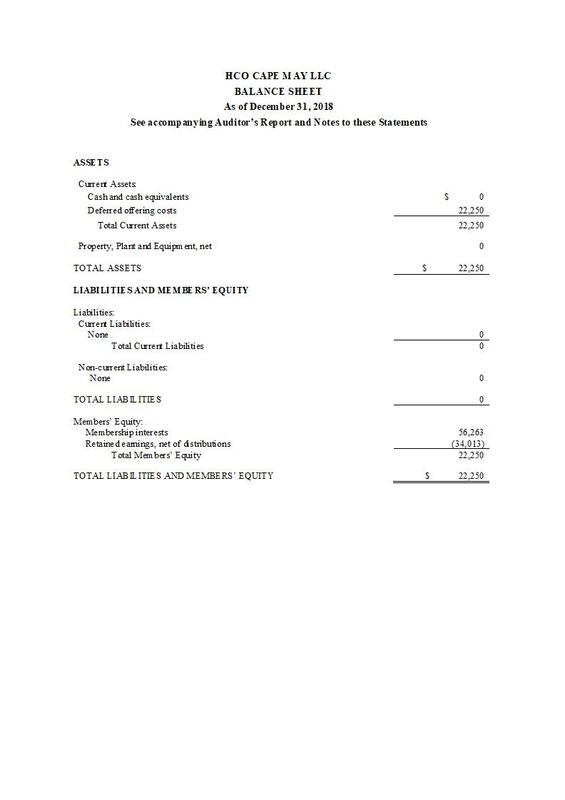 As of December 31, 2018, the net tangible book value of the Company was $56,263 since the Company has not generated any revenue to date but had cumulative development expenses equal to $56,263 and $56,263 in paid-in-capital. That equates to a net tangible book value of $500 per Share on a pro forma basis. Net tangible book value per Share consists of Shareholders’ equity adjusted for the retained earnings (deficit), divided by the total number of Shares outstanding. The pro forma net tangible book value, assuming full subscription in this Offering, would be $500 per Share. If the Offering is fully subscribed, the net tangible book value per Share owned by the Company’s current Shareholders will not increase. The net tangible book value per Share for new investors will remain at $500 per Share. These calculations do not include the costs of the Offering, although the costs of the Offering will be capitalized into the hotel development and as such expenses will not cause dilution. There is not a material disparity between the price of the Shares in this Offering and the effective cost to existing Shareholders for the Voting Shares acquired by them in a transaction during the past year. However, the economic rights associated with the Voting Shares are different than with the Non-Voting Shares being sold hereunder, so there may be a material disparity in excess value created by the Voting Shareholders compared to that received by purchasers of the Non-Voting Shares hereunder. The Company’s operations to date have been funded by HotelierCo LLC, Mark Alden Lukas, Edward Celata and Valor Hospitality Holdings, LLC. Total funding provided by these sources from inception through December 31, 2018 amounted to $56,263. The total contribution from Mark Alden Lukas will be $25,000 worth of Voting Shares from cash contributions to date ($7,625) and the remainder being proceeds from the sale of 119 Myrtle Avenue, West Cape May, NJ 08204. The contribution from Edward Celata will be $25,000 worth of Voting Shares from cash contributions to date ($7,625) and the remainder being proceeds from the sale of 123 Broadway, West Cape May, NJ 08204. The contribution from Valor Hospitality Holdings, LLC will be $150,000 worth of Voting Shares made up from contributions in cash and the taking Voting Shares from payments due under the technical services and pre-opening agreement. The contribution from HotelierCo LLC will be worth $300,000 from cash contributions to date ($41,013) and the remainder being from the development management fee. The effective contribution for Shares acquired by investors in transactions during the past year was $500 per Voting Share, which is the same as the public contribution under this Offering for the Nonvoting Shares. will require a minimum of 27,800 Shares to break escrow and distribute funds to the Company. The Company will not initially sell the Shares through commissioned broker-dealers, but may do so after the commencement of the offering. Any such arrangement will add to our expenses in connection with the offering. If we engage one or more commissioned sales agents or underwriters, we will supplement this Form 1-A to describe the arrangement. The Company will undertake one or more closings on a rolling basis as funds are received from investors with the initial closing occurring once $13,900,000 has been raised. Such considerations will include the amount of funds raised in the Offering prior to such closing, the feedback received from market participants regarding their interest in participating in the Offering and the impact that a closing would have on the continuation of the Offering. At each closing, funds held in escrow will be distributed to the Company, and the associated Shares will be issued to all investors at the same time following the closing of the Offering. Funds tendered by investors will be kept in an escrow account until the next closing after they are received by the escrow agent. All subscribers will be instructed by the Company or its agents to transfer funds by ACH transfer directly to the escrow account established for this Offering which the escrow agent shall deposit into such escrow account and release to the Company at each closing. Except as stated above, subscribers have no right to a return of their funds unless no closings have occurred by the termination date of the Offering, in which event investor funds held in escrow will promptly be refunded to each investor without interest or deductions. The Company may terminate the Offering at any time for any reason at its sole discretion and may extend the Offering past the planned termination date in the absolutely discretion of the Company. None of the Shares being sold in this Offering are being sold by existing securities holders. All of the Shares were authorized as of December 31, 2018. After the Offering Circular has been qualified by the Securities and Exchange Commission (the “SEC”), the Company will accept tenders of funds to purchase the Shares. The Company intends to engage North Capital as escrow agent and the escrow agreement will be filed as Exhibit 1A-8 to this Form 1-A of which this Preliminary Offering Circular is a part. The Company initially will use the website, www.Hotelierco.com, to provide notification of the Offering. This Preliminary Offering Circular will be furnished to prospective investors via download 24 hours per day, 7 days per week on the above-referenced website. You will be required to complete a subscription agreement in order to invest. The subscription agreement includes a representation that if you are not an “accredited investor” as defined under federal securities law, you are investing an amount that does not exceed the greater of 10% of your annual income or 10% of your net worth, as described in the subscription agreement. investor. After the expiration of the thirty (30) business pay period, if not accepted by the Company, the attempted purchase will be deemed rejected. If accepted and upon payment in full to the Company for the Shares, pending satisfaction of the $13,900,000 minimum offering amount, the Company will issue the applicable Shares to the investor. All orders to purchase the Company’s Shares received by NCPS, whether initial or additional, and whether solicited or unsolicited, are subject to acceptance by and shall only become effective upon confirmation by the Company. The Company has agreed to pay NCPS a cash success fee equal to 0.65% on all capital raised in the Offering. In addition to the selling commissions, these fees and expenses include a non-accountable due diligence fee to North Capital in the amount of $10,000 in due diligence expenses it incurs. In addition, our Manager will pay licensing and servicing fees to North Capital Investment Technology, Inc., an affiliate of the Dealer Manager, pursuant to a software and services license agreement between North Capital Investment Technology, Inc. and our Manager. Investors will not be responsible for reimbursing our Manager for any of these fees paid to the Dealer Manager or North Capital Investment Technology, Inc. In addition, our Manager will pay to North Capital, as Escrow Agent: (i) an escrow administration fee ($500 for the first 90 days, then $100 per month), (ii) wire disbursements ($25 per domestic wire; $45 per international wire), (iv) check disbursements ($10 per check), and (v) transaction costs ($100 for each additional escrow break). The Company may engage additional broker-dealers to perform additional services, including possibly joining a syndicate or selling group of broker-dealers for placement agent services. Additional fees to those disclosed in this Offering Circular, may be paid to these additional broker-dealers if they are retained. This Offering will commence on the qualification of this Offering Circular, as determined by the Securities and Exchange Commission and continue for a period of 180 days. The Company may extend the Offering for an additional time period unless the Offering is completed or otherwise terminated by the Company. Funds received from investors will be counted towards the Offering only if the form of payment clears the banking system and represents immediately available funds held by the Company prior to the termination of the subscription period, or prior to the termination of the extended subscription period if extended by the Company, or as otherwise set out herein. If you decide to subscribe for any Shares in this Offering, you must deliver funds for acceptance or rejection. The minimum investment amount for a single investor is $2,500.00 for 5 Shares unless reduced on a case-by-case basis by the Company. If a subscription is rejected, all funds will be returned to subscribers within ten days of such rejection without deduction or interest. Upon acceptance by the Company of a subscription, a confirmation of such acceptance will be sent to the investor. by the Company to the investor, without interest or deductions. This is an offering made under an exemption from registration via “Tier 2” of Regulation A. The Shares will be sold only to a person if the aggregate purchase price paid by such person is no more than 10% of the greater of such person's annual income or net worth, not including the value of his primary residence, as calculated under Rule 501 of Regulation D promulgated under Section 4(a)(2) of the Securities Act of 1933, as amended. In the case of sales to fiduciary accounts (Keogh Plans, Individual Retirement Accounts (IRAs) and Qualified Pension/Profit Sharing Plans or Trusts), the above suitability standards must be met by the fiduciary account, the beneficiary of the fiduciary account, or by the donor who directly or indirectly supplies the funds for the purchase of the Shares. Investor suitability standards in certain states may be higher than those described in this Form 1-A and/or Offering Circular. These standards represent minimum suitability requirements for prospective investors, and the satisfaction of such standards does not necessarily mean that an investment in the Company is suitable for such persons. Different rules apply to accredited investors. The Shares may not be offered, sold, transferred, or delivered, directly or indirectly, to any person who (i) is named on the list of “specially designated nationals” or “blocked persons” maintained by the U.S. Office of Foreign Assets Control (“OFAC”) at www.ustreas.gov/offices/enforcement/ofac/sdn or as otherwise published from time to time, (ii) an agency of the government of a Sanctioned Country, (iii) an organization controlled by a Sanctioned Country, or (iv) is a person residing in a Sanctioned Country, to the extent subject to a sanctions program administered by OFAC. A “Sanctioned Country” means a country subject to a sanctions program identified on the list maintained by OFAC and available at www.ustreas.gov/offices/enforcement/ofac/sdn or as otherwise published from time to time. Furthermore, the Shares may not be offered, sold, transferred, or delivered, directly or indirectly, to any person who (i) has more than fifteen percent (15%) of its assets in Sanctioned Countries or (ii) derives more than fifteen percent (15%) of its operating income from investments in, or transactions with, sanctioned persons or Sanctioned Countries. The sale of Shares of the same class as those to be offered for the period of distribution will be limited and restricted to those sold through this Offering. Because the Shares being sold are not publicly or otherwise traded, the market for the securities offered is presently stabilized. Computershare will serve as transfer agent to maintain Shareholder information. 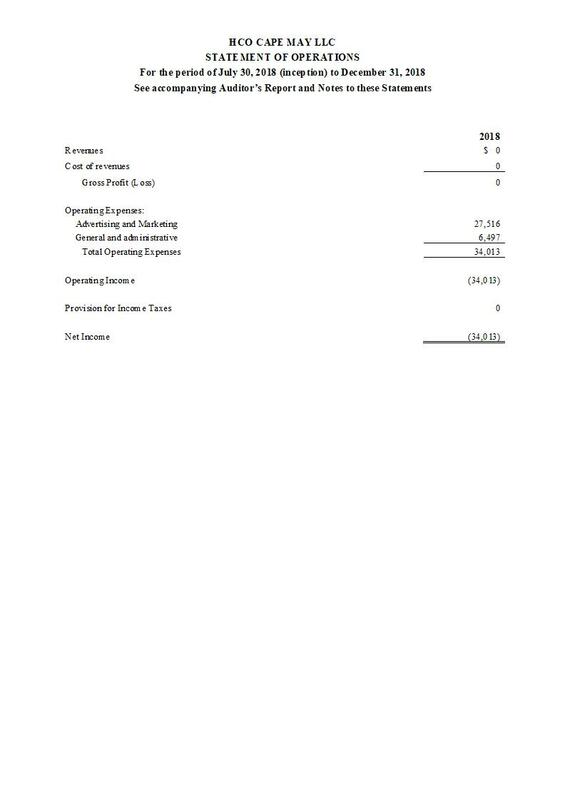 The Use of Proceeds is an estimate based on the Company’s current business plan. The Company may find it necessary or advisable to reallocate portions of the net proceeds reserved for one category to another, or to add additional categories, and the Company will have broad discretion in doing so. the Company will not close the Offering without having raised a minimum of $13,900,000 in funds. The amount reflects the expected cost to develop the hotel and cover the costs of the Offering. The maximum gross proceeds from the sale of the Shares in this Offering are $35,000,000.00. The net proceeds from the Offering, assuming it is fully subscribed, are expected to be approximately $34,522,500.00 after the payment of offering costs including broker-dealer fees. All of the costs associated with the project are included in the sources and uses and will be capitalized against the development project. The estimate of the budget for offering costs is an estimate only and the actual offering costs may differ from those expected by management. Management of the Company has wide latitude and discretion in the use of proceeds from this Offering. Ultimately, management of the Company intends to use a substantial portion of the net proceeds for construction and general working capital. At present, management’s best estimate of the use of proceeds, at various funding milestones, is set out in the chart below. However, potential investors should note that this chart contains only the best estimates of the Company’s management based upon information available to them at the present time, and that the actual use of proceeds is likely to vary from this chart based upon circumstances as they exist in the future, various needs of the Company at different times in the future, and the discretion of the Company’s management at all times. The Company reserves the right to change the use of proceeds set out herein based on the needs of the ongoing business of the Company and the discretion of the Company’s management. The Company may reallocate the estimated use of proceeds among the various categories or for other uses if management deems such a reallocation to be appropriate. The Company intends to acquire surrounding properties to increase the rooms owned by the Company. If the Company does not use the full proceeds allocation for 'Adjoining Sites – Acquisitions and Closing Costs’ and ‘Adjoining Sites – Renovation Costs’ the remaining proceeds will be returned to investors on a pari-passu basis. (1) The Offering Expenses are estimated at a total of $237,000.00 in the chart above, but may vary from that total. The estimated Offering Expenses in this chart include, among other things, legal fees, accounting costs, reproduction expenses, due diligence, marketing, consulting, broker-dealer retainer and advisory fees, broker-dealer out-of-pocket expenses, administrative services, other costs of blue sky compliance, and actual out-of-pocket expenses incurred by the Company selling the Shares, but which do not include fees to be paid to the escrow agent or technology provider or commissions paid to NCPS. 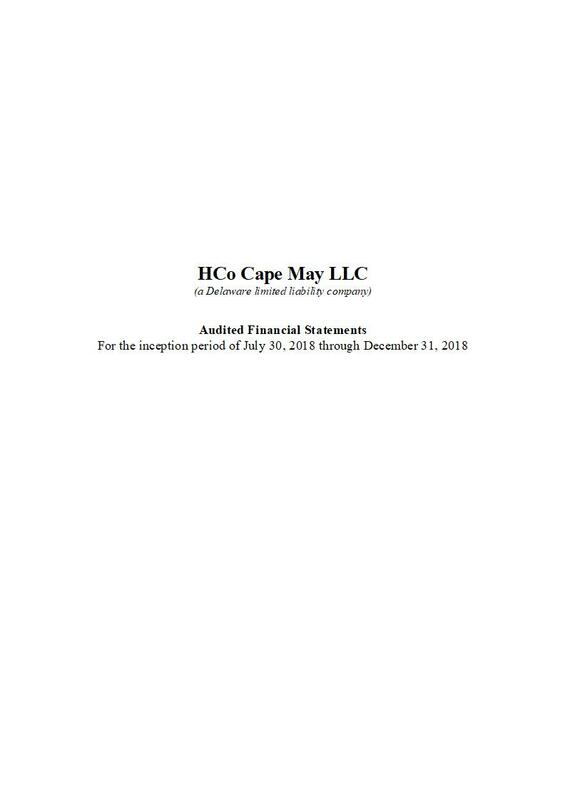 HCo Cape May LLC (the “Company”) is a Delaware Limited Liability Company formed on July 30, 2018. The Company is raising capital in this Offering to purchase real property and to renovate an existing historic mansion creating a hotel on said property in West Cape May, New Jersey. Plans are for the hotel to be called The Ewing and to be a luxury boutique hotel to house 23 rooms, a rooftop pool and a refined restaurant. Additional funds above the build out of The Ewing hotel will be opportunistic in nature and look to be used to acquire adjoining parcels of commercial land that will allow for more rooms under management. The additional product will allow for overflow demand in peak season and spread the fixed cost of hotel operations across a larger amount of hotel inventory. The Ewing in West Cape May, New Jersey, will be a luxury boutique hotel set to house 23 rooms, a rooftop pool and a refined restaurant. The hotel will partner with a quality management service to provide customers with a best of Cape May experience. The hotel project involves renovating a pre-existing historic mansion and constructing a new extension that will house hotel style accommodation. Any further accumulation of land for hotel rooms is intended to be additive to The Ewing brand and operations. Cape May is America’s oldest seaside resort. With over 30 miles of beautiful white sandy beaches, this charming, quaint town is perfect for a romantic getaway or a family vacation. The antithesis of the Jersey Shore — instead of nightclubs and tanning parlors, visitors will find Victorian mansions and a famous lighthouse. Cape May is home to a National Historic District with nearly 600 preserved Victorian buildings. Cape May’s County seal remained relevant in 2018 with agriculture, fishing and maritime activities still attracting visitors to Cape May County, similar to what attracted settlers more than 325 years ago. Valor is a hospitality management company. Valor provides hands-on experience developing hotels and resorts, both corporate and independent, which have been recognized as being in the best of their categories not only financially, but critically, from an exemplary guest experience. Valor develop a property strategy to target the delivery of the maximum operating performance. The Company’s business plan is to acquire the fee simple interest in two parcels of land entitled to build a 23-room luxury boutique hotel. A contract for this acquisition has been executed, and is included in the Material Contracts section, Exhibit 1A-6. The Company will be renovating a pre-existing historic mansion and building out a similar structure to house the new hotel rooms to an accommodation quality well exceeding anything in the current market. The construction will also include the demolition and removal of an old building on the second parcel of land to allow the development of a zone conforming carpark for hotel guests and restaurant patrons. The total project cost, including land, for The Ewing will be approximately $14.4 million with a forecast IRR of 10.4% without the use of debt after management fees payable to HotelierCo LLC. The Company will look to acquire and renovate adjoining sites to increase the rooms owned by the Company. The Company owns no real property. The Company is under contract to purchase the following real properties. For details of the purchase agreement, and further details relating to the real property to be purchased, see the Contract For Purchase and Sale of Real Estate in the Material Contracts section, Exhibit 1A-6. 123 Broadway, West Cape May, NJ 08204 consisting of 0.17 acres known as Block 4, Lots. 20.01 and 20.02, located in the Borough of West Cape May, Cape May County, New Jersey as well as all easements, appurtenances, rights and privileges as contained in or in any way pertaining to or beneficial thereto. The Company is not involved in any litigation and is not aware of any pending or threatened legal actions. Valor Hospitality Partners, LLC, an affiliate of Valor Hospitality Holdings, LLC has pending litigation with Westlake, Reed, Leskosky, LLC (CV 18 908 411) relating to architectural services in 2016. It is not anticipated that this case will have any impact on the Company. You should read the following discussion and analysis of the Company's financial condition and results of the Company's operations together with the Company's financial statements and related notes appearing at the end of this Offering Circular. This discussion contains forward-looking statements reflecting the Company’s current expectations that involve risks and uncertainties. Actual results and the timing of events may differ materially from those contained in these forward-looking statements due to a number of factors, including those discussed in the section entitled “Risk Factors” and elsewhere in this Offering Circular. 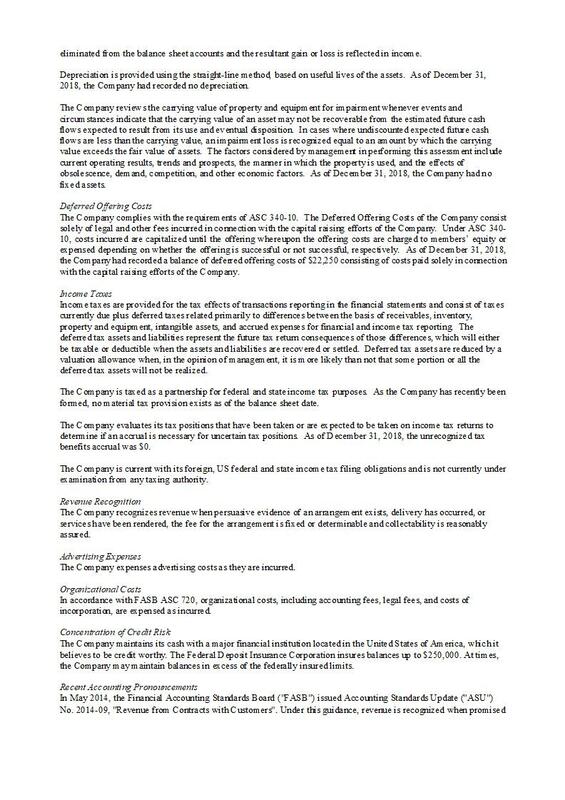 HCo Cape May LLC (the “Company”) is a Delaware Limited Liability Company formed for the general purpose of engaging in any lawful activity for which corporations may be organized under the laws of Delaware and to develop the Cape May real property and hotel described in this Offering Circular. The Company was formed on July 30, 2018 as a Delaware Limited Liability Company. There are two classes of Shares in the Company: Voting Shares and Non-Voting Shares. Shares to be issued pursuant to this Offering will be Non-Voting Shares. For more details on the rights of the Shares, see the Operating Agreement attached hereto and the section “Securities Being Offered” below. Revenue. Total revenue for the period from July 30, 2018 (date of inception) to December 31, 2018 was $0 as the Company was in the start-up phase. Operating Expenses. Operating expenses for the period from July 30, 2018 to December 31, 2018 were $56,263. Operating expenses for the period were comprised of legal & professional fees of $37,250; pre-opening marketing expenses for $27,516; and travel for $1,497. However, these expenses are classed as long-term assets as they are all costs that will be capitalized into the development project. Net Loss. Net loss for the period from July 30, 2018 to December 31, 2018 was $0. This is equal to the operating expenses plus accrued interest of $0 since there were no revenues during that start-up period. Costs that have occurred in the Company will be capitalized into the project. During the period from July 30, 2018 to December 31, 2018, the Company received funding consisting of cash and services from HotelierCo LLC, Mark Alden Lukas, and Edward Celata, which were used to cover the operating expenses. The Company had net cash of $0 on December 31, 2018. The Company's plan of operation for the 12 months following the commencement of this Offering is to complete the transaction on the land to acquire the two West Cape May properties from Mark Alden Lukas and Edward Celata. Following acquisition, the final set of construction plans needs to be developed and delivered to go to market for a general contractor to price and negotiate the final construction package. The intent is to have this process completed before the end of 2019. Once the final construction price is determined, the project will be underwritten based on market at the time and ensure that the investment still meets similar investment hurdles before proceeding. The intent will be to mobilize the construction team and general contractor to start the development of The Ewing Hotel. Assuming the full raise of funds is complete it is the intent of the Company to negotiate the acquisition of adjoining sites if accretive to the business plan and sites being available for acquisition. Because the Company is still in the startup phase and because the Company has only recently launched, the Company is unable to identify any recent trends in revenue or expenses since the latest financial year. 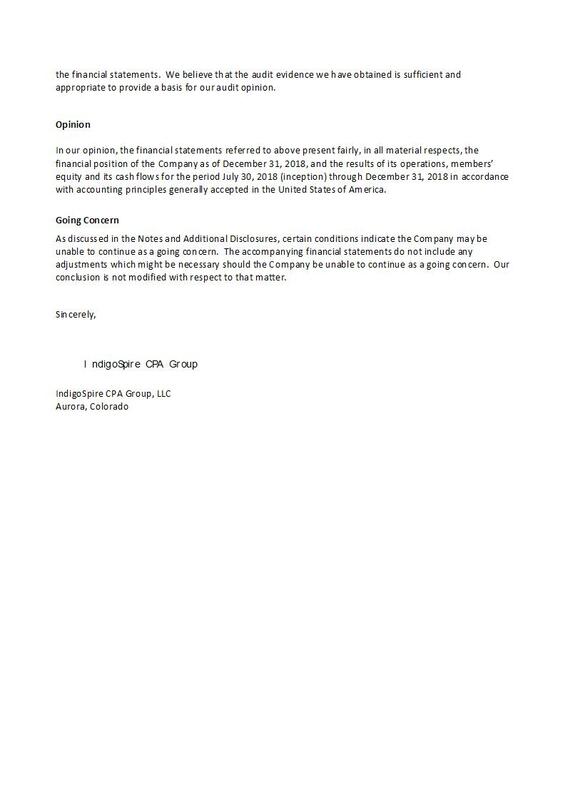 Thus, the Company is unable to identify any known trends, uncertainties, demands, commitments or events involving its business that are reasonably likely to have a material effect on its revenues, income from continuing operations, profitability, liquidity or capital resources, or that would cause the reported financial information in this Offering to not be indicative of future operating results or financial condition. The Company has identified the policies outlined below as critical to its business operations and an understanding of its results of operations. The list is not intended to be a comprehensive list of all of its accounting policies. Capitalize all costs associated with the development of the property through until opening. The Company recognizes revenue when (1) guests make a room reservation at the hotel; (2) guests or patrons visit the restaurant and pay for food and beverage; (3) meetings and events are booked and paid for at the hotel; and (4) any ancillary license or lease on the property to external third parties (such as cell phone towers) if appropriate. The Company’s planned sources of revenue include: (1) guests make a room reservation at the hotel; (2) guests or patrons visit the restaurant and pay for food and beverage; (3) meetings and events are booked and paid for at the hotel; and (4) any ancillary license or lease on the property to external third parties (such as cell phone towers) if appropriate. From July 30, 2018 (date of inception) to December 31, 2018, the Company had $0 in revenue. The Company had no product returns July 30, 2018 (date of inception) to December 31, 2018. The Company has not filed for bankruptcy protection nor has it ever been involved in receivership or similar proceedings. The Company is not presently involved in any legal proceedings material to the business or financial condition of the Company. The Company does not anticipate any material reclassification, merger, consolidation, or purchase or sale of a significant proportion of assets (not in the ordinary course of business) during the next 12 months. As of the date of this Offering Circular, the Company has no full-time employees. The Company does not intend to hire employees. The company is managed by a sole Manager, Nathan Kivi, and does not have a board of directors. Nathan Kivi is 39 years old and has held the office of Manager from July 30, 2018 to the present. Kivi works approximately 20 hours per week in the capacity of Manager. The Manager is subject to removal and replacement by vote of Shareholders holding a majority of the Voting Shares; Non-Voting Shares sold hereunder do not vote. Nathan Kivi is a serial entrepreneur who has a passion for results-oriented management in the hospitality, finance and real estate sectors. With 16 years of experience in corporate finance, investment banking, asset management, fund management experience, Nathan has a proven track record in roles including Chief Investment Officer for SB&G and Chief Strategy Officer for Valor Hospitality. SB&G is a funds management company out of Australia and Nathan is responsible for setting up an investment platform in the United States. The first two acquisitions in 2018 included an operating asset requiring a large renovation and a ground up development. The total cost on completion of these two assets is $140.0 million. Valor Hospitality is a hotel management company managing hotels across the United States, United Kingdom and South Africa. Valor also set up two new offices at the end of 2018, one in Hong Kong and one in Dubai. Through strategic foresight, industry partnerships and a wealth of knowledge, Nathan built a strong foundation for HotelierCo, which he founded in 2017.
any employees and pay any compensation, the Company may pay existing officers in the future, and may hire additional officers in the future and pay them, and may also choose to compensate its directors in the future. The Company has not entered into any employment agreements with anyone, including its sole Manager, and it is not the Company’s intent to have employment agreements in the future. The Company does not have a board of directors as it is managed by a sole manager. As such, the Company does not have any “independent” directors as defined in Rule 4200 of FINRA’s listing standards. The Company may create a board of directors and/or appoint an independent director(s) to its board of directors in the future, particularly to serve on appropriate committees should they be established. In addition, if the Company forms a board of directors, it may establish an audit committee, compensation committee, a nominating and governance committee and other committees to the board in the future. Unless a board is formed and such committees are established, matters that would otherwise be addressed by the board and by such committees will be acted upon by the manager. The Company Operating Agreement limits the liability of the manager. The Company is obligated by the Operating Agreement to indemnify and hold harmless the manager (and any officers) from and against any and all claims and demands whatsoever in connection with the business of the Company, provided that the act or omission did not constitute bad faith, gross negligence, reckless misconduct or breach of fiduciary duty on the part of such person and that the act or omission did not occur prior to, or at the time of, the formation of the Company and, provided further that, regardless of when the act or omission occurs, any claim or demand arising with respect to any prior employment, independent contractor status or other business relationship is expressly excluded from indemnification pursuant to the Operating Agreement. For further details on this limitation of liability and indemnification, read the Company’s Operating Agreement, a copy of which has been attached as Exhibit 1A-2B to this Offering Circular. There is no pending litigation or proceeding involving the Company’s manager as to which indemnification is required or permitted, and the Company is not aware of any threatened litigation or proceeding that may result in a claim for indemnification. The following table sets forth information regarding beneficial ownership of our Shares as of the date of this Offering Circular. Beneficial ownership and percentage ownership are determined in accordance with the rules of the Securities and Exchange Commission and include voting or investment power with respect to Shares. This information does not necessarily indicate beneficial ownership for any other purpose. Unless otherwise indicated and subject to applicable community property laws, to the Company’s knowledge, each Shareholder named below possesses sole voting and investment power over their Shares, where applicable. Percentage of beneficial ownership before the offering is based on 1,000 Voting Shares outstanding as of the date of this Offering Circular. The following table sets forth information regarding beneficial ownership of all classes of the Company’s Shares as of the date of this Offering Circular. HotelierCo LLC is a hotel fund management company and is owned 79% by Capital Fuse LLC. Capital Fuse LLC is a wholly owned entity of Nathan Kivi the sole Manager of the Company. For a detailed explanation of the roles of certain related parties, please read the section below titled Interest of Management and Others in Certain Related-Party Transactions. HotelierCo LLC manages HCo Cape May LLC. A copy of this management agreement is attached in the Material Contracts section of this Offering Circular. Valor is hotel management company owned by multiple parties - they will manage the hotel based on the terms in the technical services agreement and pre-opening agreement with HCo Property Cape May LLC. A copy of this agreement is attached in the Material Contracts section of this Offering Circular. Valor holds Voting shares in HCo Cape May LLC and is compensated through Voting Shares instead of typical incentive management fees. HotelierCo LLC owns 60% of the Voting Shares in the Company and, as such, currently controls the Company. HotelierCo LLC is a hotel fund management company. HotelierCo LLC has a management agreement which appoints HotelierCo LLC as manager of HCo Cape May LLC as its agent with regards to hotel project matters. The fee for this service paid by HCo Cape May LLC is 1.5% per year of the Company’s value. A copy of this management agreement is attached in the Material Contracts section of this Offering Circular. Holdings, LLC – the company that is running the hotel operations and management for the HCo Cape May LLC property. HotelierCo LLC is owned 1% by Kendall Almerico – who is responsible for the submission and work for preparing the Regulation A Offering Circular. Valor Hospitality (“Valor”) owns 30% of the Voting Shares in the Company. Valor is a full-service global hospitality management company. Valor has a technical services agreement and pre-opening agreement with HCo Property Cape May LLC that also lays out terms of the hotel management agreement to be entered. A copy of this agreement is attached in the Material Contracts section of this Offering Circular. Once the hotel is open and operational, Valor will be paid a management fee of the greater of $90,000 per year of operation or 3.0% of Gross Revenue. •Creating, then developing themes and concepts for hotel restaurant as well as fitness, library, and meeting space. •Inspecting general contractor completed work for quality and providing defects to be corrected. •Conducting official opening ceremony and opening for trading. Once the hotel is open and operational, Valor will be responsible for the day to day operations and management of all aspects of the hotel including all revenue streams and the operational costs of the hotel. Nathan Kivi, the sole Manager of Company and of HotelierCo LLC, is the Chief Strategy Officer of Valor. In that role, Nathan is responsible for helping Valor grow the management business pipeline. HotelierCo LLC was formed to allow Valor to partner with investors through crowdfunding via Regulation A offerings qualified by the Securities and Exchange Commission. Valor also owns 20% of HotelierCo LLC, the management company for the Company. HCo Property Cape May LLC is a wholly owned subsidiary of the Company and it is controlled by the Company. The purpose of the entity is to provide a subordinated holding structure should the Company require debt in the future. The Company is offering up to $35,000,000.00 of its Shares to investors in this Offering. The Shares being offered are Non-Voting Shares in the Company. The Shares, when issued, will be fully paid and non-assessable. This Offering Circular and this section do not purport to give a complete description of all rights related to the Shares, and both are qualified in their entirety by the provisions of the Company’s Operating Agreement (Exhibit 1A-2B), a copy of which has been attached as an Exhibit to this Offering Circular. If all of the Shares in this Offering are sold, the Shares would represent approximately 98.6% of the issued and outstanding combined Shares of the Company. The Offering will remain open for 180 days from the date of this Offering Circular, unless terminated for any reason at the discretion of the Company, or unless extended for up to an additional one hundred eighty (180) days by the Company. The Company reserves the unqualified discretionary right to reject any subscription for Shares, in whole or in part. If the Company rejects any offer to subscribe for the Shares, it will return the subscription payment, without interest or reduction. The Company's acceptance of your subscription will be effective when an authorized representative of the Company signs the Subscription Agreement. There are two classes of Shares in the Company as of the date of this Offering Circular: Voting Shares and Non-Voting Shares. In this Offering, the Company is only selling Non-Voting Shares. The Company does not expect to create any additional classes of shares during the next 12 months, but the Company is not limited from creating additional classes which may have preferred dividend, voting and/or liquidation rights or other benefits not available to holders of its Shares if it chooses to do so. Any Shareholder of the Company who holds Non-Voting Shares will have the same rights, preferences and qualifications as Voting Shareholders except that voting have voting rights and Non-Voting Shareholders have no voting rights. The rights, preferences and privileges of the Voting Shares and Non-Voting Shares are set forth in the Company’s Operating Agreement (attached as Exhibit 1A-2B) and are described in summary form in this section of the Offering Circular. The price per Share in this Offering is $500.00 per Share. The minimum subscription that will be accepted from an investor is Two Thousand Five Hundred Dollars ($2,500.00) (the "Minimum Subscription"), however, the Company reserves the right to accept a lower amount in the Company’s absolute discretion. A subscription for Two Thousand Five Hundred Dollars ($2,500.00) or more in Shares may be made only by tendering to the Company the executed Subscription Agreement (Exhibit 1A-4) delivered with this Offering Circular and the subscription price in a form acceptable to the Company. The execution and tender of the documents required, as detailed in the materials, constitutes a binding offer to purchase the number Shares stipulated therein and an agreement to hold the offer open until the offer is accepted or rejected by the Company. The subscription price of the Shares is based on a combination of an independent third party appraisal on the land being acquired plus the anticipated development cost (including soft costs). The book value does not represent nor is it intended to imply that the Shares being offered have a market value or could be resold at that price, even if a sale were permissible. The subscription price is payable in ACH transfers or some other form acceptable to the Company as set out in this Offering Circular. The Company may accept wires transfers or checks on a case-by-case basis. The Shares being offered in this Offering Circular have no voting rights. Control of the Company and nearly all management decisions affecting the Company will be exercised only by those holding Voting Shares, which are not being offered herein. Except as otherwise required by law or the Company’s Operating Agreement, each holder of Voting Shares shall be entitled to vote equally, one vote per Share on all matters for which Voting Shareholders are entitled to vote. The securities being sold in this Offering, Non-Voting Shares, have no voting rights, and holders of these Shares should not expect to be able to influence any decisions by management of the Company through voting on Company matters as a result. Holders of Non-Voting Shares being offered in this Offering are not entitled to vote on any matter on which the Voting Shareholders of the Company are entitled to vote, and such Non-Voting Shareholders will not be included in determining the number of shareholders voting or entitled to vote on any such matters. 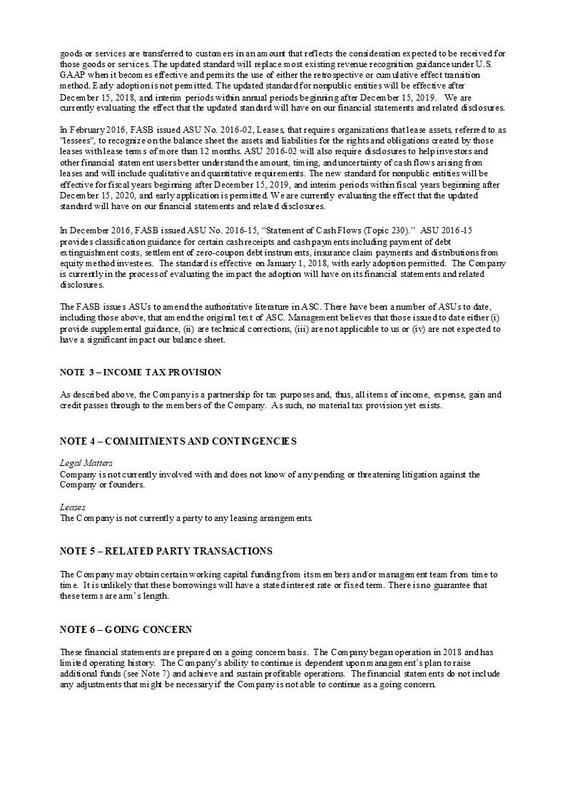 For a full description of the voting rights of the Shares offered herein, please review the Operating Agreement (Exhibit 1A-2B). (iv)Lastly, 50% pro rata to the Non-Voting Shareholders in accordance with their Percentage Interests, and 50% pro rata to the Voting Shareholders in accordance with their Percentage Interests. For the definitions of “Cash Flow,” “Unpaid 7.5% Priority Return” and “Unpaid 10.0% Priority Return” you should carefully read and understand the definitions of these terms in the Company’s Operating Agreement, attached to this Offering Circular as Exhibit 1A-2B. (iii)Lastly, 50% pro rata to the Non-Voting Shareholders in accordance with their Percentage Interests, and 50% pro rata to the Voting Shareholders in accordance with their Percentage Interests. 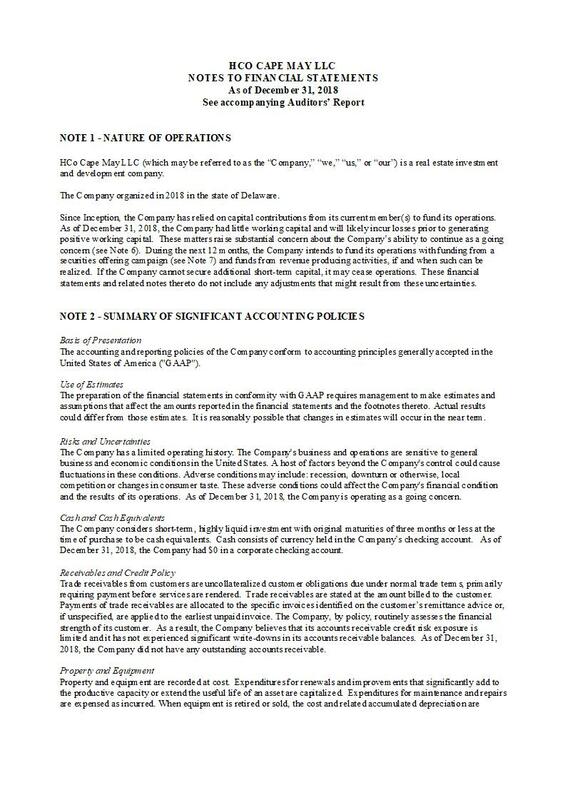 For the definitions of “Capital Proceeds” “Unreturned Capital Contribution” and “Unpaid 130% Priority Return” you should carefully read and understand the definitions of these terms in the Company’s Operating Agreement, attached to this Offering Circular as Exhibit 1A-2B. Other rules and limitations exist related to distributions. For a full description of rights of the Shares related to distributions, you should carefully read and understand the Company’s Operating Agreement (Exhibit 1A-2B). The Shares in this Offering are subject to Tag Along and Drag Along provisions. In the event that a majority of the Voting Shareholders agrees to accept an offer to acquire all or any portion of the Company in a bona fide arms’ length sale, each Voting and Non-Voting Shareholder of the Company shall have the right and obligation to participate in such transaction; provided, that the purchase price be allocated on a pro rata basis according to each Voting and Non-Voting Shareholder’s percentage interests and the payment terms therefor shall be on the same terms for all Voting and Non-Voting Shareholders. For a full description of rights of the tag along and drag along rights, you should carefully read and understand the Company’s Operating Agreement (Exhibit 1A-2B). The Shares will not be subject to further calls or assessment by the Company. The Shares may not be transferred or assigned to any person without the prior written consent of the sole Manager. There are no other restrictions on alienability of the Shares in the corporate documents other than those disclosed in this Offering Circular. The Company intends to engage Computershare to serve as the transfer agent and registrant for the Shares. The Shares are uncertificated and, as such, will not contain legends, as such would exist on a stock certificate. However, the language of any such legends applicable to the Shares and as set out in this Offering Circular, will apply to each Share and shall govern the purchaser and holder of each such Share, and the rules of each such legend. Recent changes to Regulation A promulgated under the Securities Act prohibit an issuer from claiming an exemption from registration of its securities under such rule if the issuer, any of its predecessors, any affiliated issuer, any director, executive officer, other officer participating in the offering of the interests, general partner or managing member of the issuer, any beneficial owner of 20% or more of the voting power of the issuer’s outstanding voting equity securities, any promoter connected with the issuer in any capacity as of the date hereof, any investment manager of the issuer, any person that has been or will be paid (directly or indirectly) remuneration for solicitation of purchasers in connection with such sale of the issuer’s interests, any general partner or managing member of any such investment manager or solicitor, or any director, executive officer or other officer participating in the offering of any such investment manager or solicitor or general partner or managing member of such investment manager or solicitor has been subject to certain “Disqualifying Events” described in Rule 506(d)(1) of Regulation D subsequent to September 23, 2013, subject to certain limited exceptions. 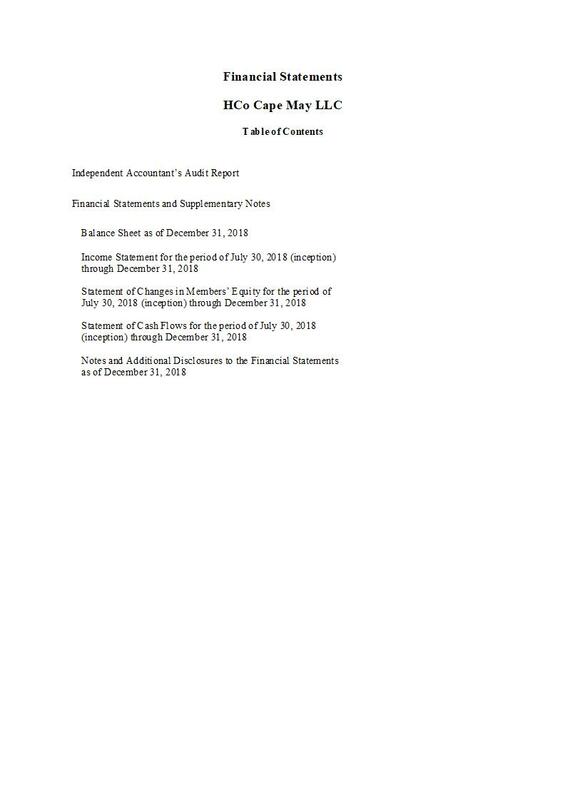 The Company is required to exercise reasonable care in conducting an inquiry to determine whether any such persons have been subject to such Disqualifying Events and is required to disclose any Disqualifying Events that occurred prior to September 23, 2013 to investors in the Company. The Company believes that it has exercised reasonable care in conducting an inquiry into Disqualifying Events by the foregoing persons and is aware of the no such Disqualifying Events. It is possible that (a) Disqualifying Events may exist of which the Company is not aware and (b) the SEC, a court or other finder of fact may determine that the steps that the Company has taken to conduct its inquiry were inadequate and did not constitute reasonable care. If such a finding were made, the Company may lose its ability to rely upon exemptions under Regulation A, and, depending on the circumstances, may be required to register the Offering of the Company’s Shares with the SEC and under applicable state securities laws or to conduct a rescission offer with respect to the securities sold in the Offering. Trustees and other fiduciaries of qualified retirement plans or IRAs that are set up as part of a plan sponsored and maintained by an employer, as well as trustees and fiduciaries of Keogh Plans under which employees, in addition to self-employed individuals, are participants (together, “ERISA Plans”), are governed by the fiduciary responsibility provisions of Title 1 of the Employee Retirement Income Security Act of 1974 (“ERISA”). An investment in the Shares by an ERISA Plan must be made in accordance with the general obligation of fiduciaries under ERISA to discharge their duties (i) for the exclusive purpose of providing benefits to participants and their beneficiaries; (ii) with the same standard of care that would be exercised by a prudent man familiar with such matters acting under similar circumstances; (iii) in such a manner as to diversify the investments of the plan, unless it is clearly prudent not do so; and (iv) in accordance with the documents establishing the plan. Fiduciaries considering an investment in the Shares should accordingly consult their own legal advisors if they have any concern as to whether the investment would be inconsistent with any of these criteria. Fiduciaries of certain ERISA Plans which provide for individual accounts (for example, those which qualify under Section 401(k) of the Code, Keogh Plans and IRAs) and which permit a beneficiary to exercise independent control over the assets in his individual account, will not be liable for any investment loss or for any breach of the prudence or diversification obligations which results from the exercise of such control by the beneficiary, nor will the beneficiary be deemed to be a fiduciary subject to the general fiduciary obligations merely by virtue of his exercise of such control. On October 13, 1992, the Department of Labor issued regulations establishing criteria for determining whether the extent of a beneficiary’s independent control over the assets in his account is adequate to relieve the ERISA Plan’s fiduciaries of their obligations with respect to an investment directed by the beneficiary. Under the regulations, the beneficiary must not only exercise actual, independent control in directing the particular investment transaction, but also the ERISA Plan must give the participant or beneficiary a reasonable opportunity to exercise such control, and must permit him to choose among a broad range of investment alternatives. Trustees and other fiduciaries making the investment decision for any qualified retirement plan, IRA or Keogh Plan (or beneficiaries exercising control over their individual accounts) should also consider the application of the prohibited transactions provisions of ERISA and the Code in making their investment decision. Sales and certain other transactions between a qualified retirement plan, IRA or Keogh Plan and certain persons related to it (e.g., a plan sponsor, fiduciary, or service provider) are prohibited transactions. The particular facts concerning the sponsorship, operations and other investments of a qualified retirement plan, IRA or Keogh Plan may cause a wide range of persons to be treated as parties in interest or disqualified persons with respect to it. Any fiduciary, participant or beneficiary considering an investment in Shares by a qualified retirement plan IRA or Keogh Plan should examine the individual circumstances of that plan to determine that the investment will not be a prohibited transaction. Fiduciaries, participants or beneficiaries considering an investment in the Shares should consult their own legal advisors if they have any concern as to whether the investment would be a prohibited transaction. Classification of our assets of as “plan assets” could adversely affect both the plan fiduciary and management. The term “fiduciary” is defined generally to include any person who exercises any authority or control over the management or disposition of plan assets. Thus, classification of our assets as plan assets could make the management a “fiduciary” of an investing plan. If our assets are deemed to be plan assets of investor plans, transactions which may occur in the course of its operations may constitute violations by the management of fiduciary duties under ERISA. Violation of fiduciary duties by management could result in liability not only for management but also for the trustee or other fiduciary of an investing ERISA Plan. In addition, if our assets are classified as “plan assets,” certain transactions that we might enter into in the ordinary course of our business might constitute “prohibited transactions” under ERISA and the Code. Under Code Section 408(i), as amended by the Tax Reform Act of 1986, IRA trustees must report the fair market value of investments to IRA holders by January 31 of each year. The Service has not yet promulgated regulations defining appropriate methods for the determination of fair market value for this purpose. In addition, the assets of an ERISA Plan or Keogh Plan must be valued at their “current value” as of the close of the plan’s fiscal year in order to comply with certain reporting obligations under ERISA and the Code. For purposes of such requirements, “current value” means fair market value where available. Otherwise, current value means the fair value as determined in good faith under the terms of the plan by a trustee or other named fiduciary, assuming an orderly liquidation at the time of the determination. We do not have an obligation under ERISA or the Code with respect to such reports or valuation although management will use good faith efforts to assist fiduciaries with their valuation reports. There can be no assurance, however, that any value so established (i) could or will actually be realized by the IRA, ERISA Plan or Keogh Plan upon sale of the Shares or upon liquidation of us, or (ii) will comply with the ERISA or Code requirements. taxation. However, if a Qualified Plan or IRA earns “unrelated business taxable income” (“UBTI”), this income will be subject to tax to the extent it exceeds $1,000 during any fiscal year. The amount of unrelated business taxable income in excess of $1,000 in any fiscal year will be taxed at rates up to 36%. In addition, such unrelated business taxable income may result in a tax preference, which may be subject to the alternative minimum tax. It is anticipated that income and gain from an investment in the Shares will not be taxed as UBTI to tax exempt shareholders, because they are participating only as passive financing sources. The Shares will be sold only to a person who is not an accredited investor if the aggregate purchase price paid by such person is no more than 10% of the greater of such person’s annual income or net worth, not including the value of his primary residence, as calculated under Rule 501 of Regulation D promulgated under Section 4(a)(2) of the Securities Act of 1933, as amended. In the case of sales to fiduciary accounts (Keogh Plans, Individual Retirement Accounts (IRAs) and Qualified Pension/Profit Sharing Plans or Trusts), the above suitability standards must be met by the fiduciary account, the beneficiary of the fiduciary account, or by the donor who directly or indirectly supplies the funds for the purchase of the Shares. Investor suitability standards in certain states may be higher than those described in this Offering Circular. These standards represent minimum suitability requirements for prospective investors, and the satisfaction of such standards does not necessarily mean that an investment in the Company is suitable for such persons. Each investor must represent in writing that he/she meets the applicable requirements set forth above and in the Subscription Agreement, including, among other things, that (i) he/she is purchasing the Shares for his/her own account and (ii) he/she has such knowledge and experience in financial and business matters that he/she is capable of evaluating without outside assistance the merits and risks of investing in the Shares, or he/she and his/her purchaser representative together have such knowledge and experience that they are capable of evaluating the merits and risks of investing in the Shares. Transferees of the Shares will be required to meet the above suitability standards. All potential purchasers of the Shares will be required to comply with know-your-customer and anti-money laundering procedures to comply with various laws and regulations, including the USA Patriot Act. The USA Patriot Act is designed to detect, deter and punish terrorists in the United States and abroad. The Act imposes anti-money laundering requirements on brokerage firms and financial institutions. Since April 24, 2002, all United States brokerage firms have been required to have comprehensive anti-money laundering programs in effect. To help you understand these efforts, the Company wants to provide you with some information about money laundering and the Company’s efforts to help implement the USA Patriot Act. recent estimate puts the amount of worldwide money laundering activity at $1 trillion a year. As a result, the Company believes it is very important to fully comply with these laws. 2 A “senior foreign political figure” is defined as a senior official in the executive, legislative, administrative, military or judicial branch of a foreign government (whether elected or not), a senior official of a major foreign political party, or a senior executive of a foreign government-owned corporation. In addition, a “senior foreign political figure” includes any corporation, business or other entity that has been formed by, or for the benefit of, a senior foreign political figure. 3 “Immediate family” of a senior foreign political figure typically includes such figure’s parents, siblings, spouse, children and in-laws. 4 A “close associate” of a senior foreign political figure is a person who is widely and publicly known to maintain an unusually close relationship with such senior foreign political figure, and includes a person who is in a position to conduct substantial domestic and international financial transactions on behalf of such senior foreign political figure. (4)If you are affiliated with a non-U.S. banking institution (a “Foreign Bank”), or if you receive deposits from, make payments on behalf of, or handle other financial transactions related to a Foreign Bank, you represent and warrant to the Company that: (a) the Foreign Bank has a fixed address, and not solely an electronic address, in a country in which the Foreign Bank is authorized to conduct banking activities; (b) the Foreign Bank maintains operating records related to its banking activities; (c) the Foreign Bank is subject to inspection by the banking authority that licensed the Foreign Bank to conduct its banking activities; and (d) the Foreign Bank does not provide banking services to any other Foreign Bank that does not have a physical presence in any country and that is not a regulated affiliate. As noted above, this Offering Circular is not providing, or purporting to provide any tax advice to anyone. Every potential investor is advised to seek the advice of his, her or its own tax professionals before making this investment. The securities sold in this Offering may have issues related to taxation at many levels, including tax laws and regulations at the state, local and federal levels in the Unites States, and at all levels of government in non-U.S. jurisdictions. The following information is provided for educational purposes only, and should not be relied upon in making an investment decision. Pursuant to the requirements of Regulation A, the issuer certifies that it has reasonable grounds to believe that it meets all of the requirements for filing on Offering Circular and has duly caused this offering statement to be signed on its behalf by the undersigned, thereunto duly authorized, in the City of Atlanta, State of Georgia on February 24, 2019.